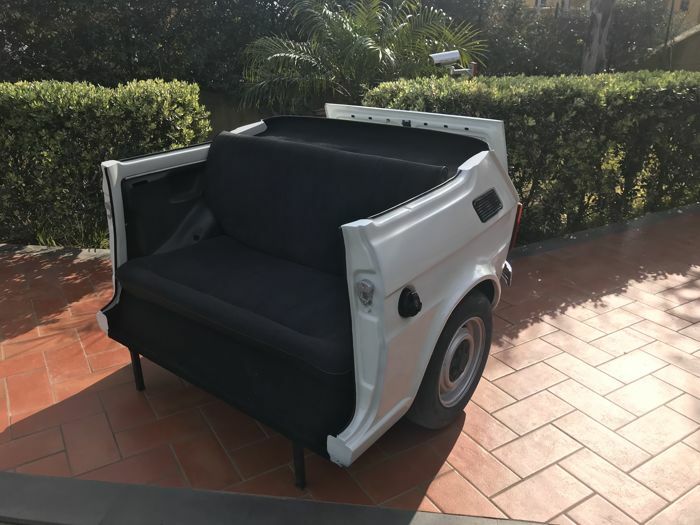 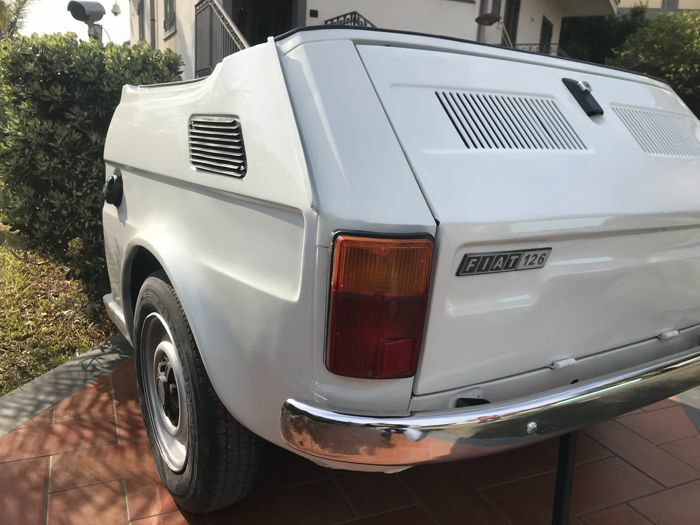 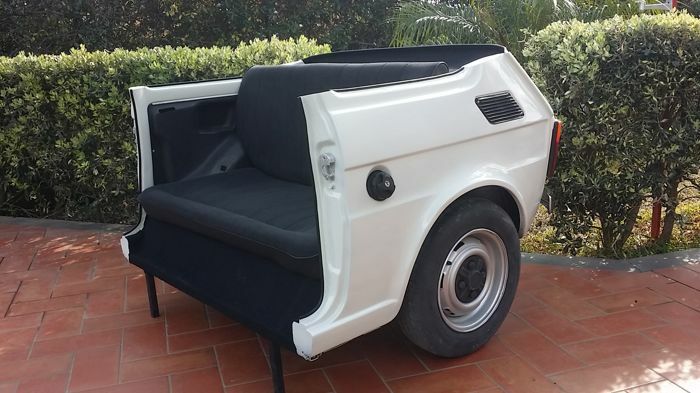 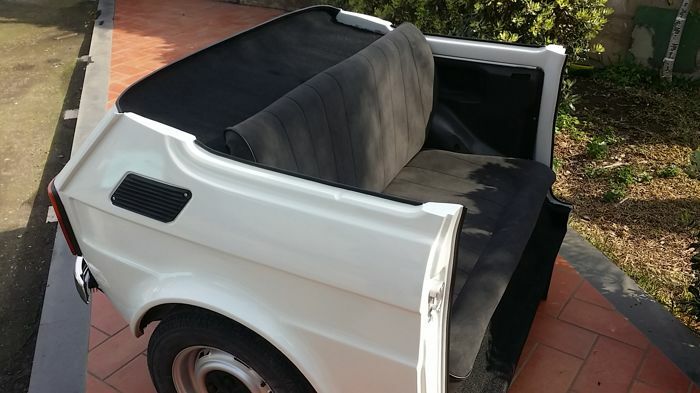 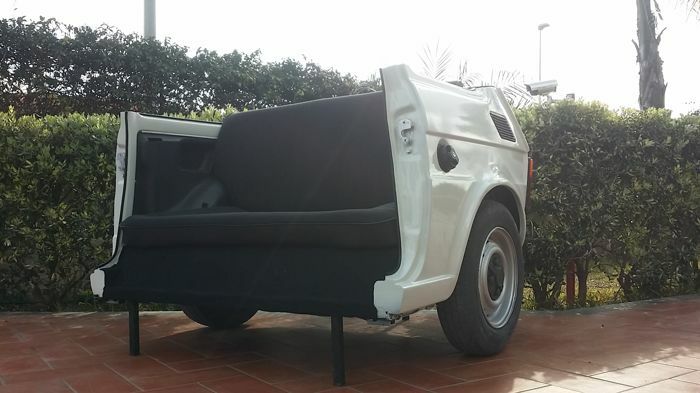 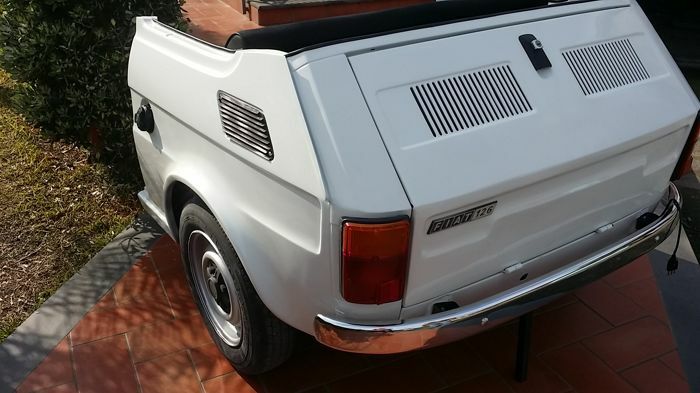 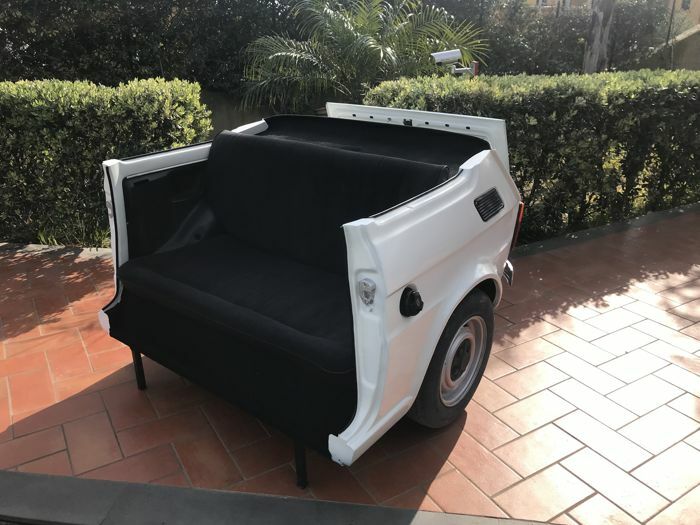 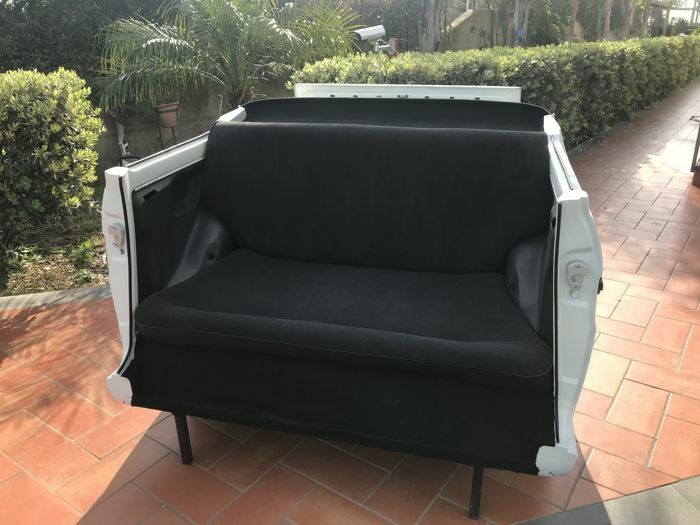 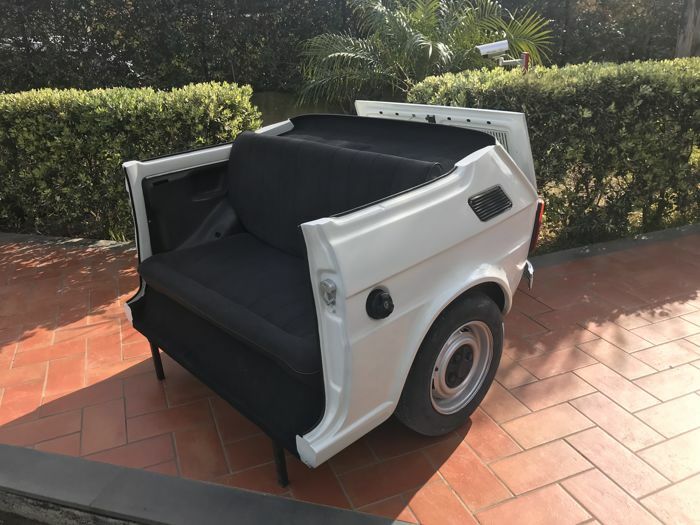 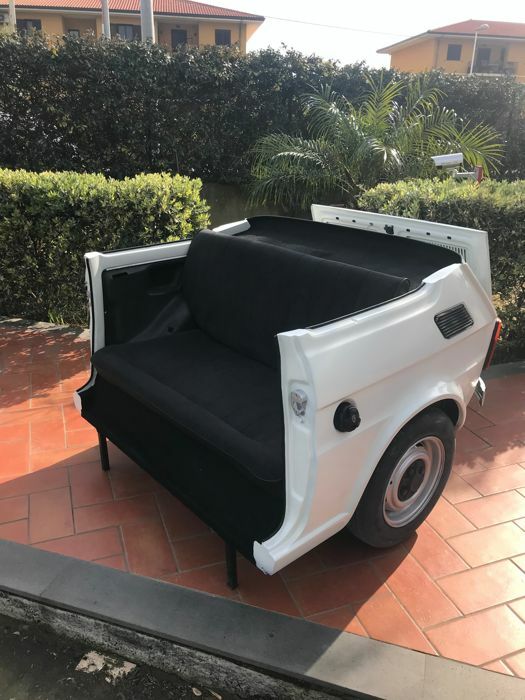 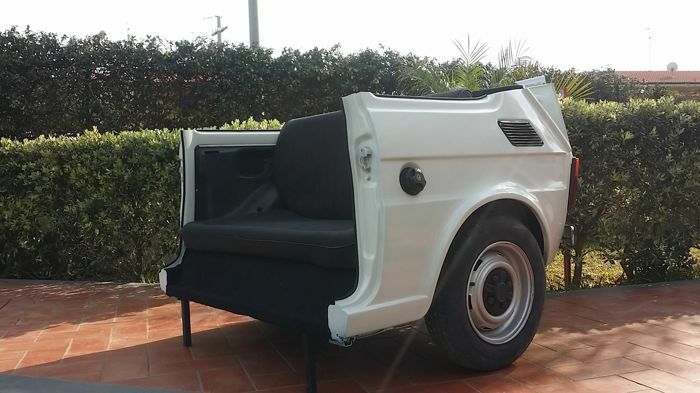 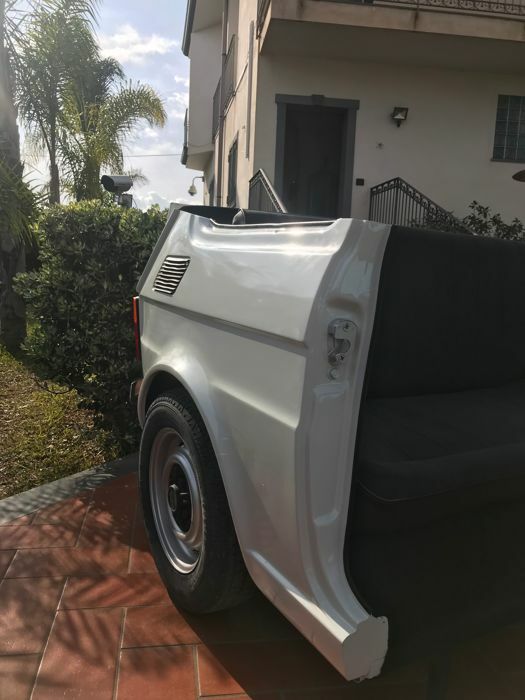 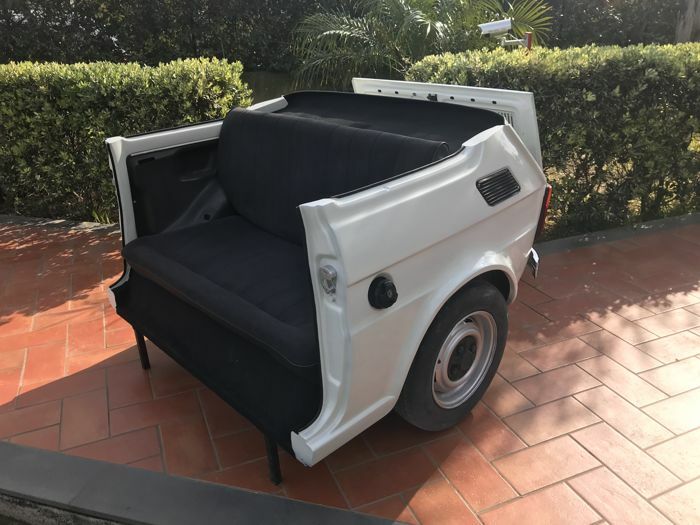 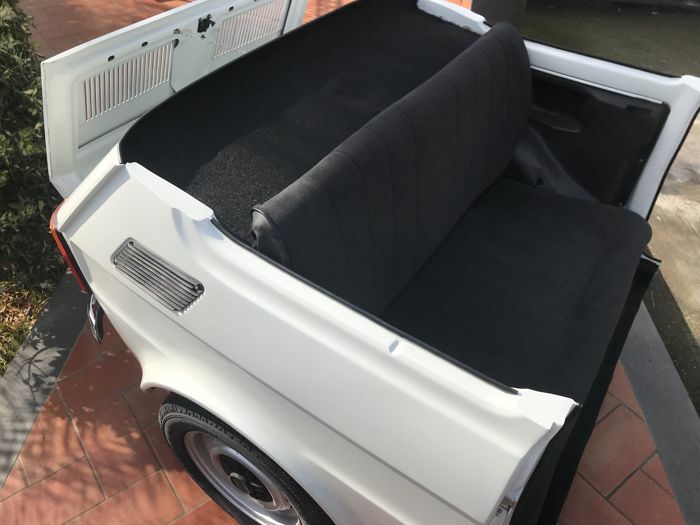 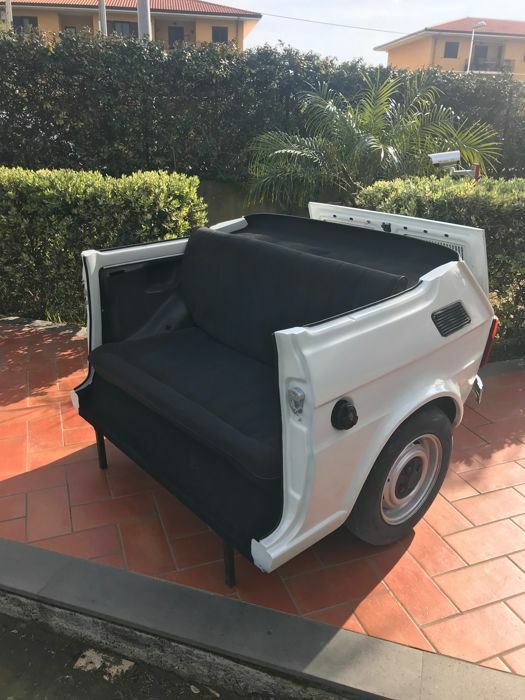 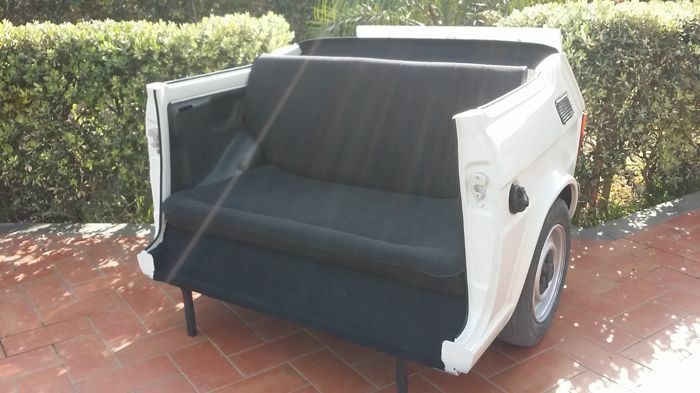 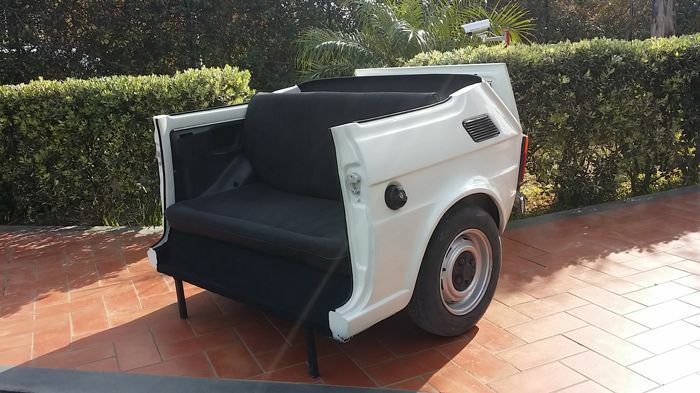 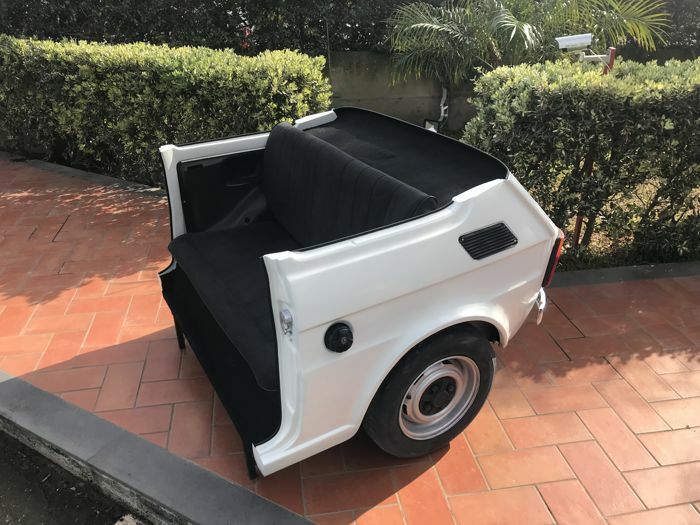 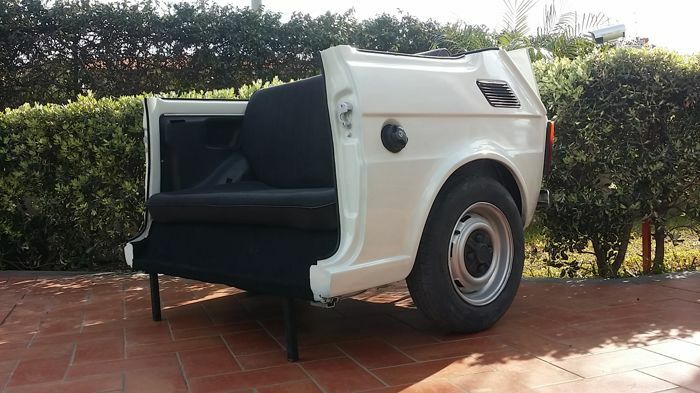 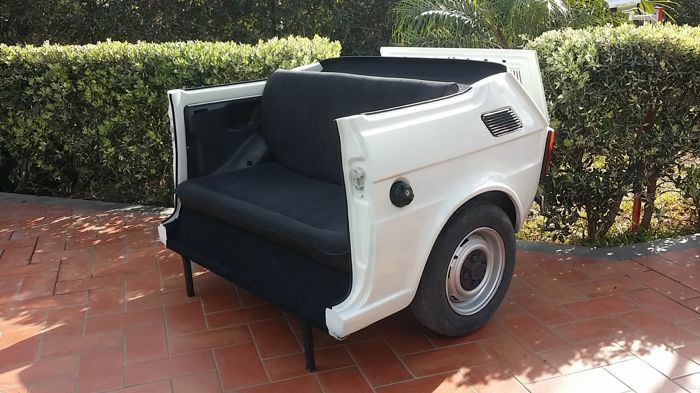 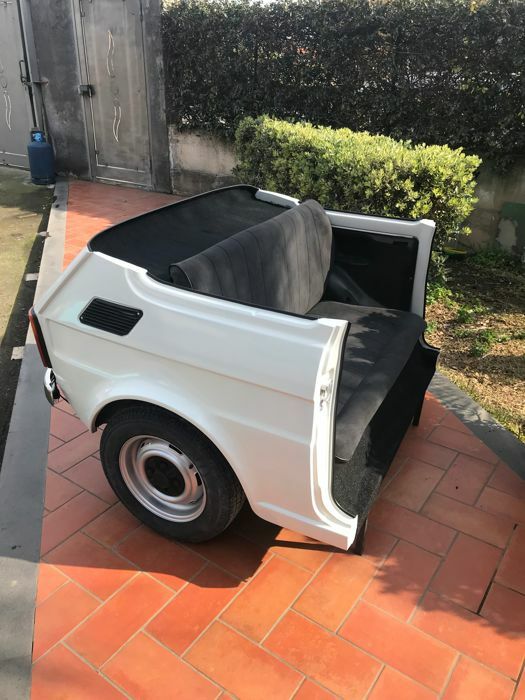 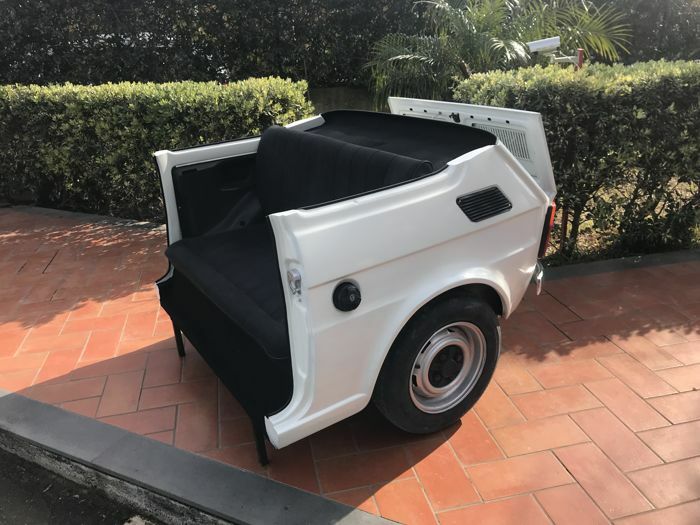 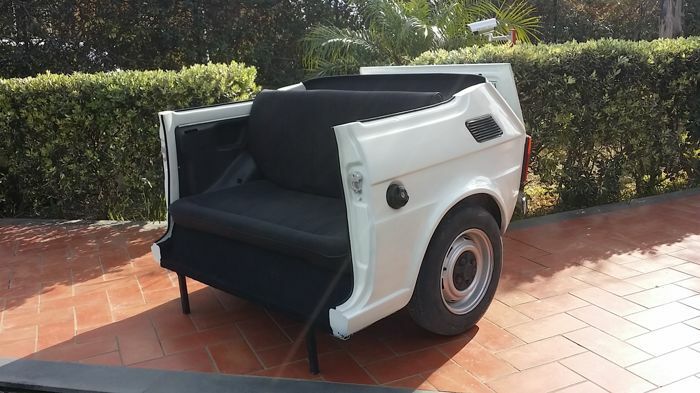 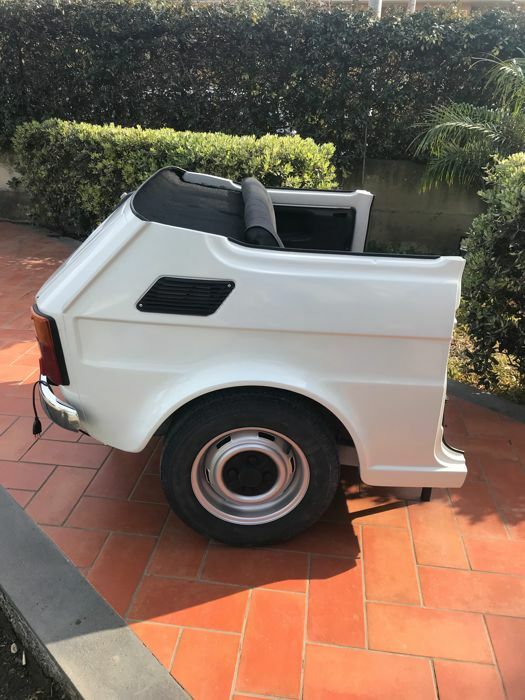 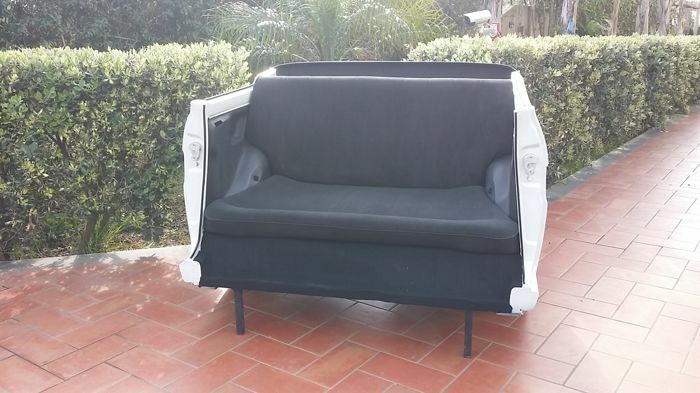 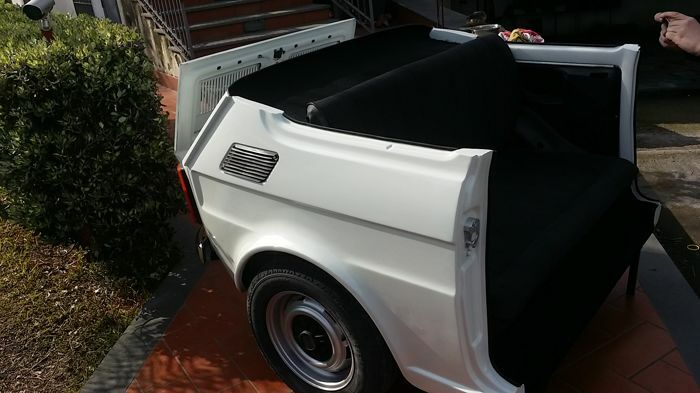 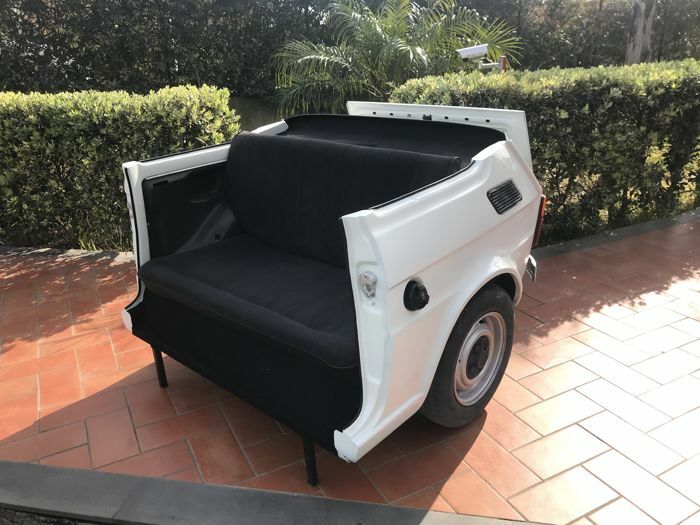 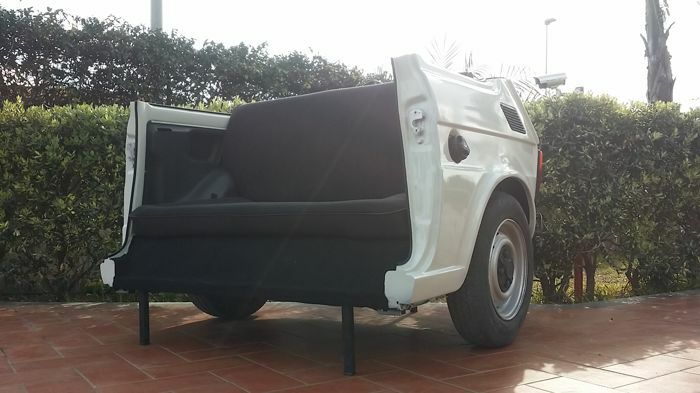 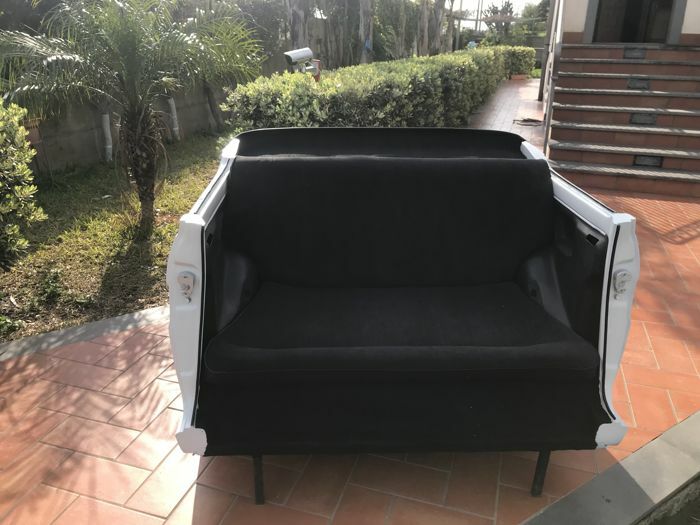 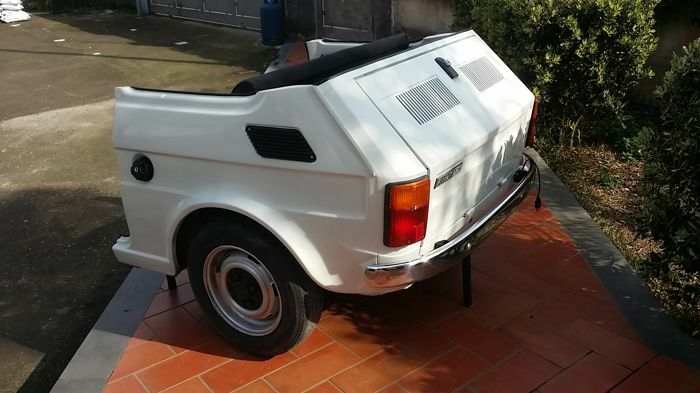 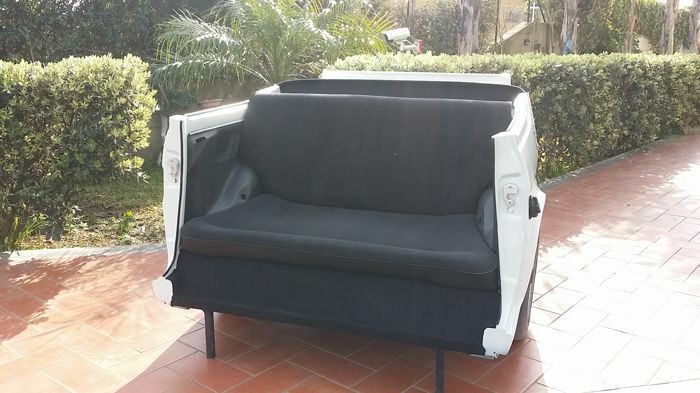 Great and wonderful Sofa realised with a real orginal Fiat 126 of 70's - In excellent condition, totally restored in white. 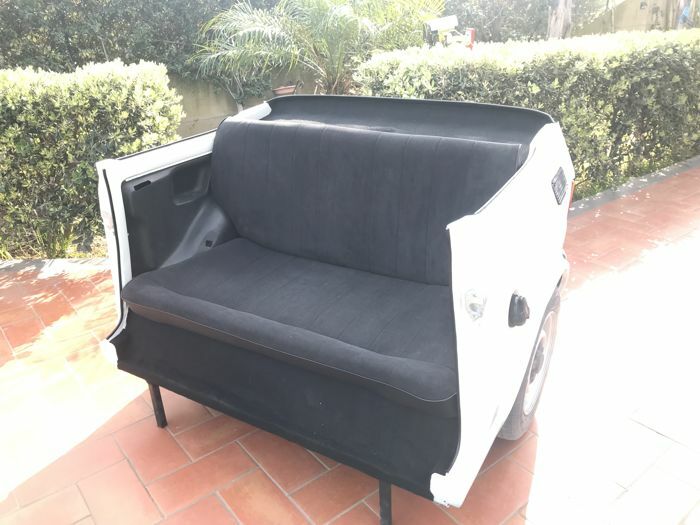 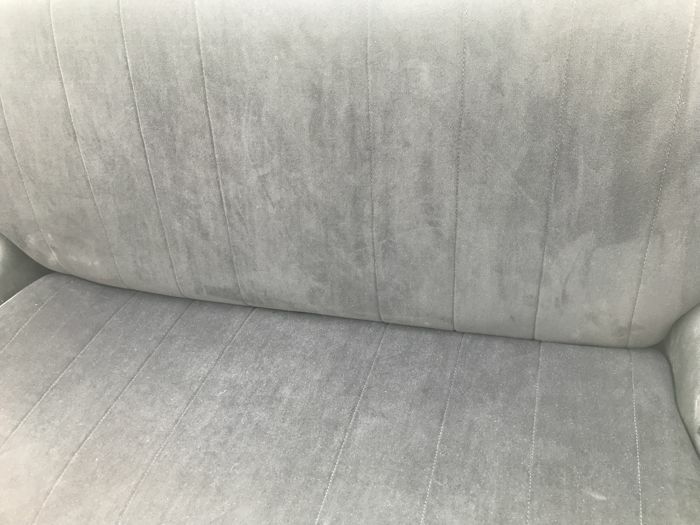 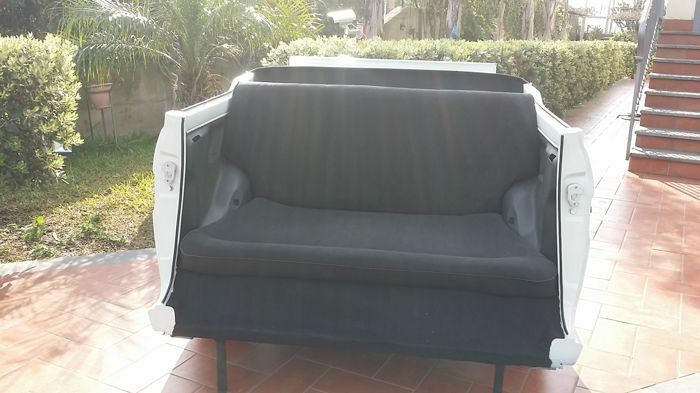 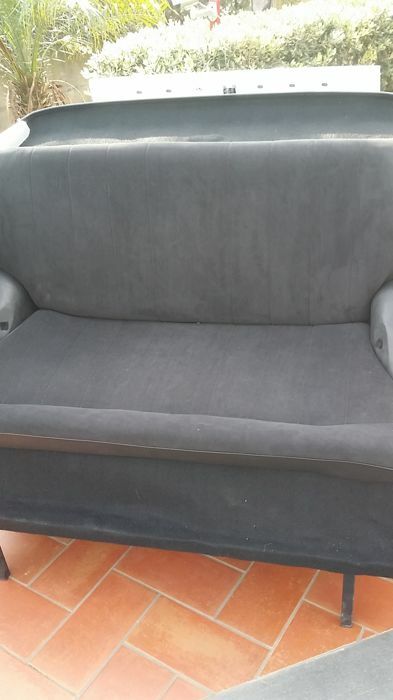 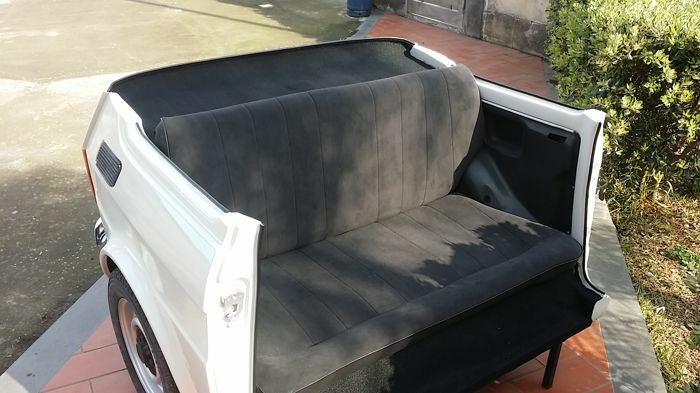 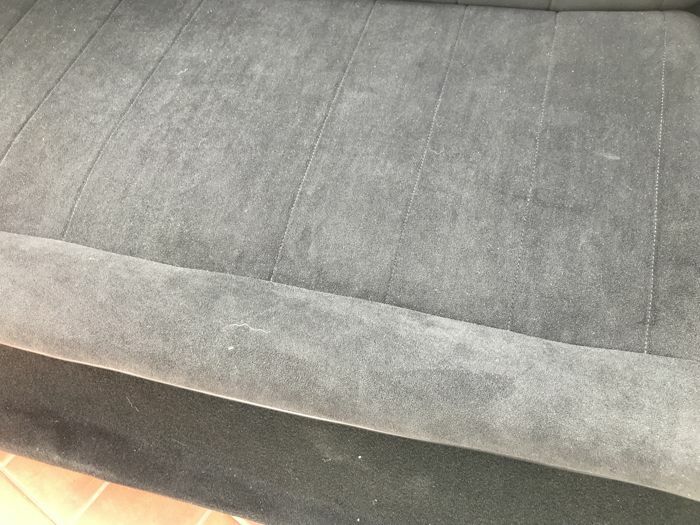 The couch is the original that was been repared and with a new black seat and border like in the original preparation of the car. 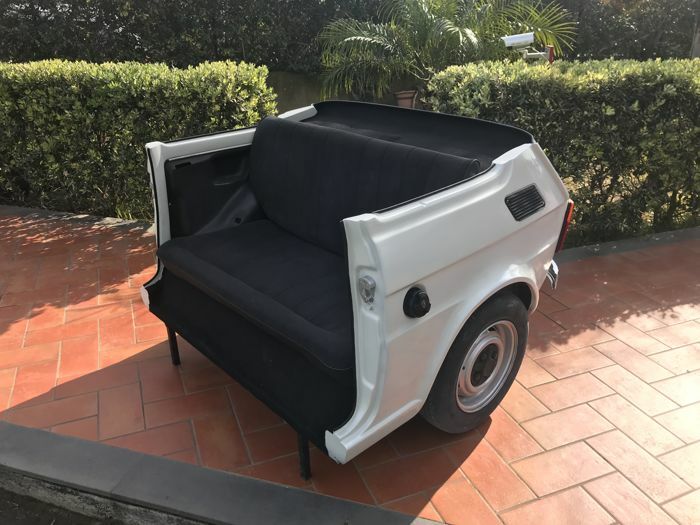 It is a unique piece that exist only in this exemplaire. 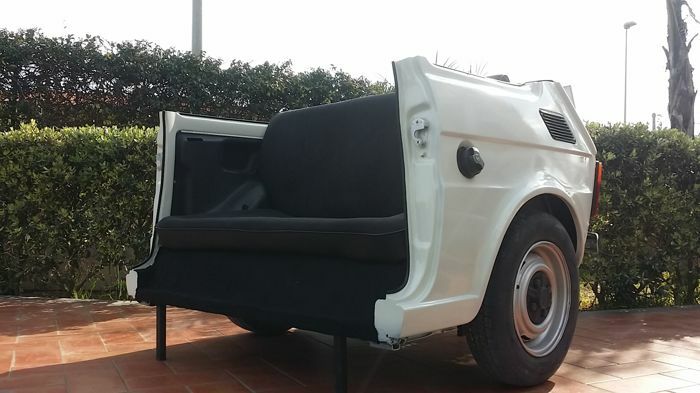 The seat is very comfortable and is for two persons. 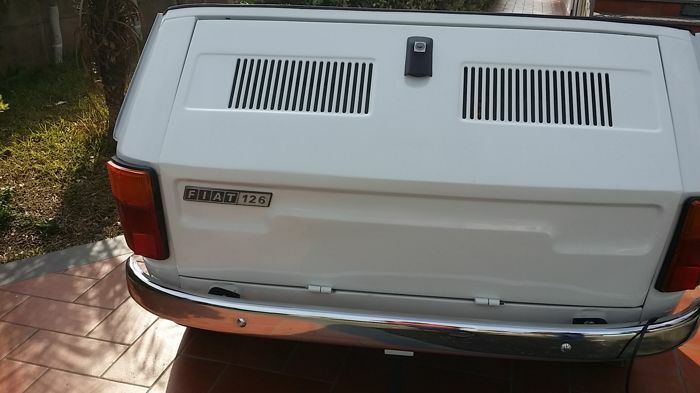 On request we can apply a car licence plate with your birthdate. 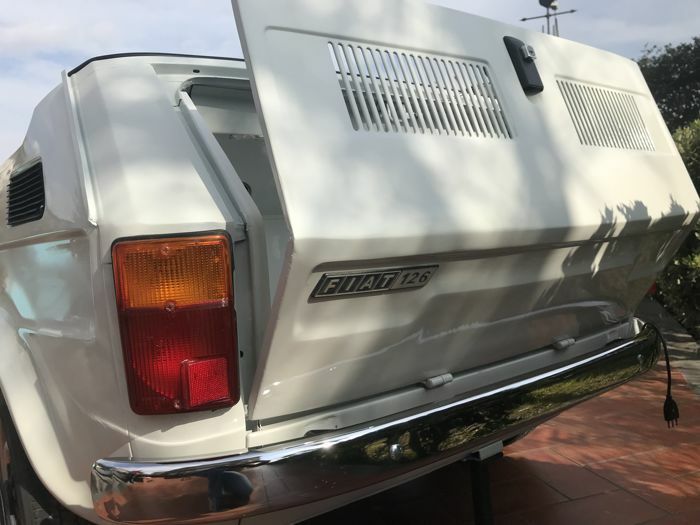 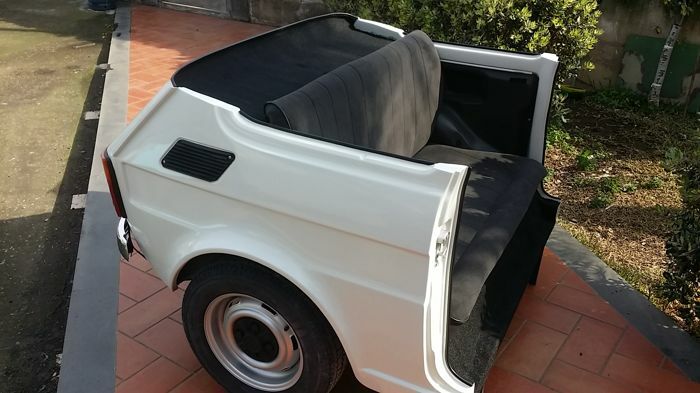 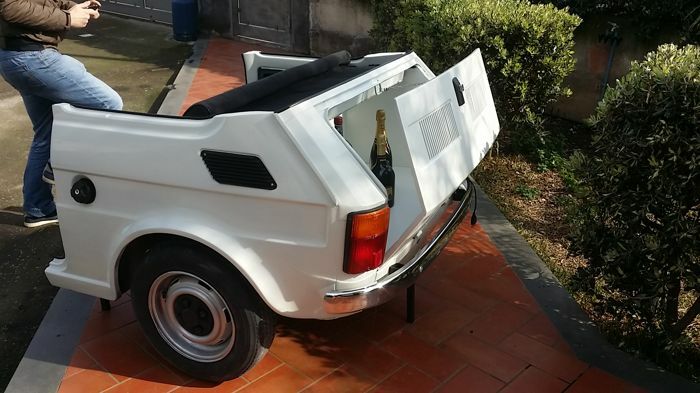 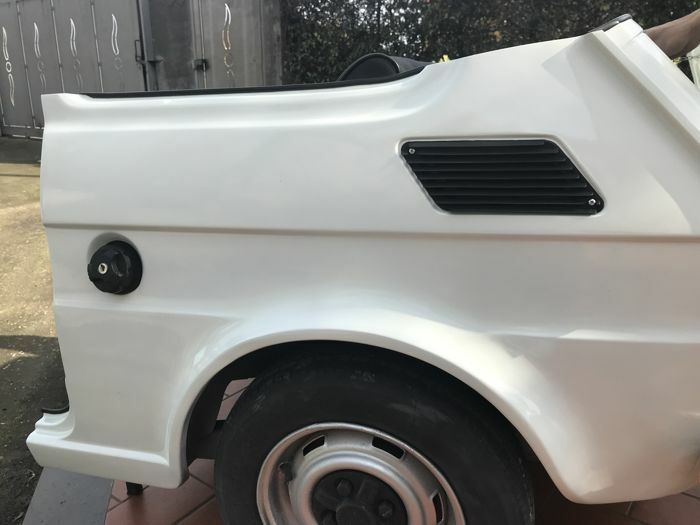 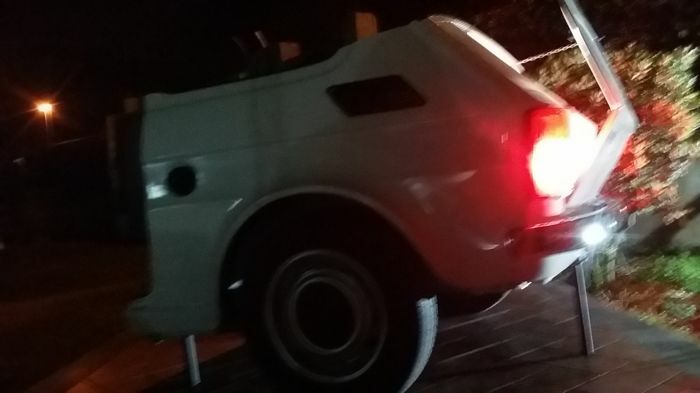 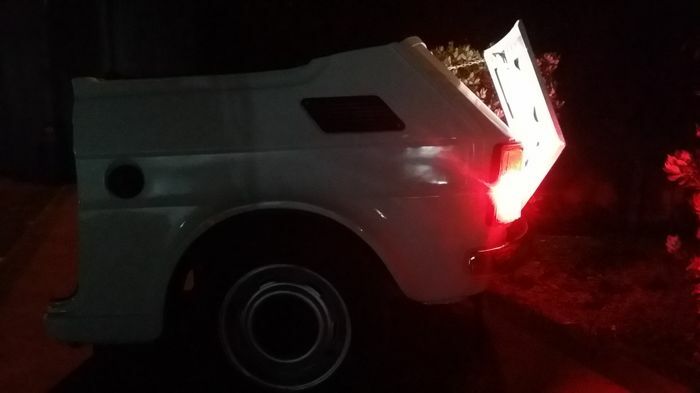 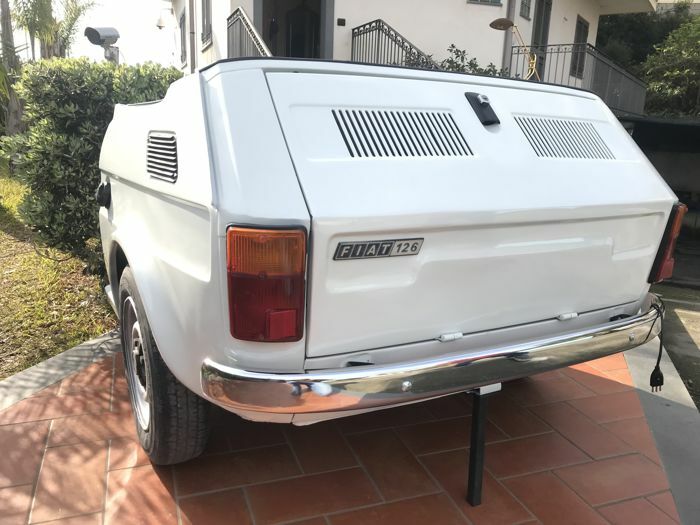 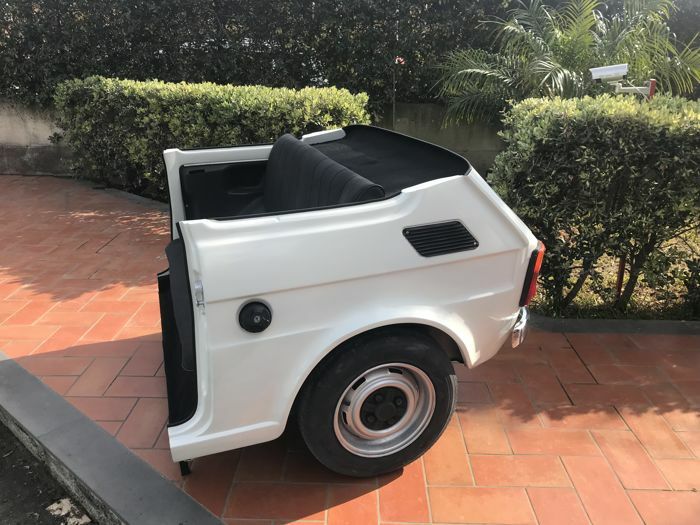 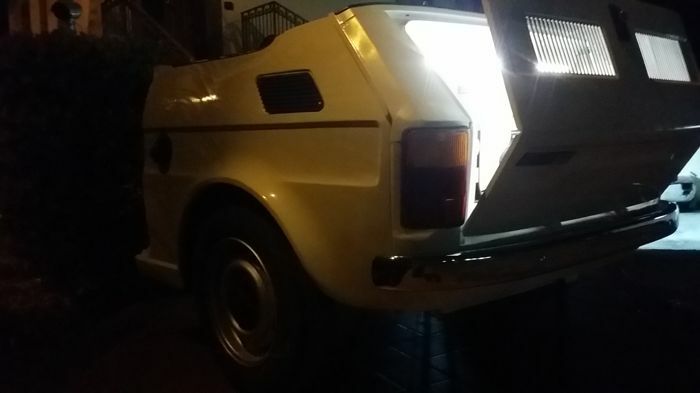 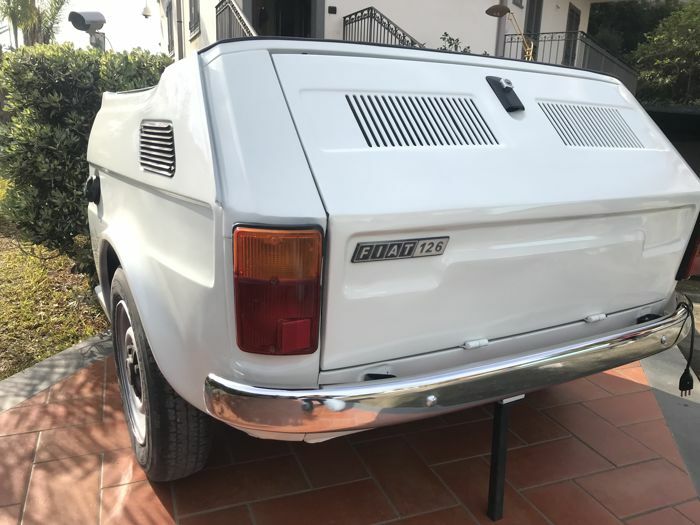 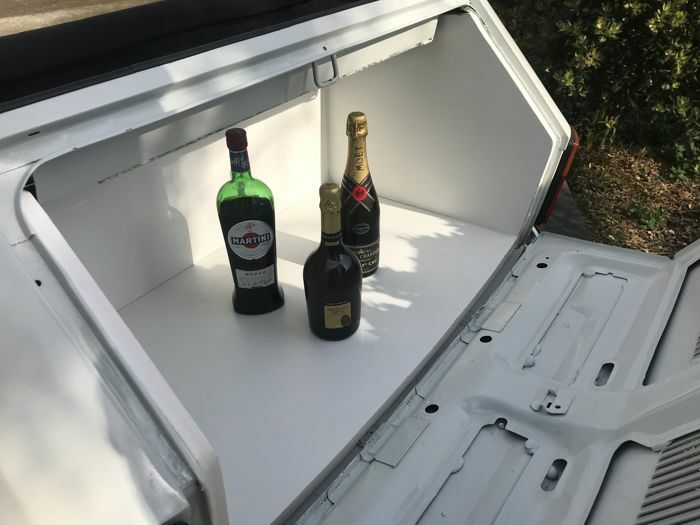 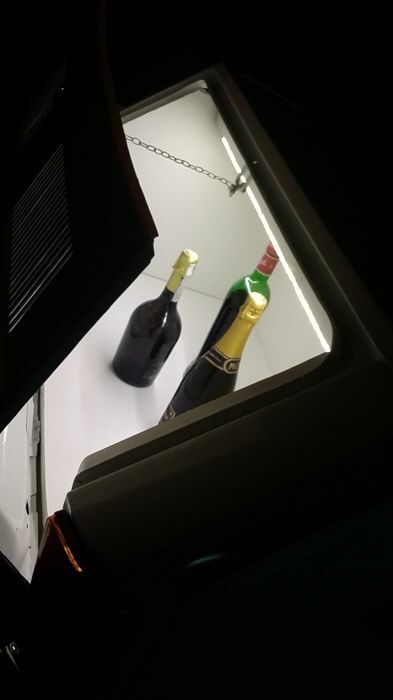 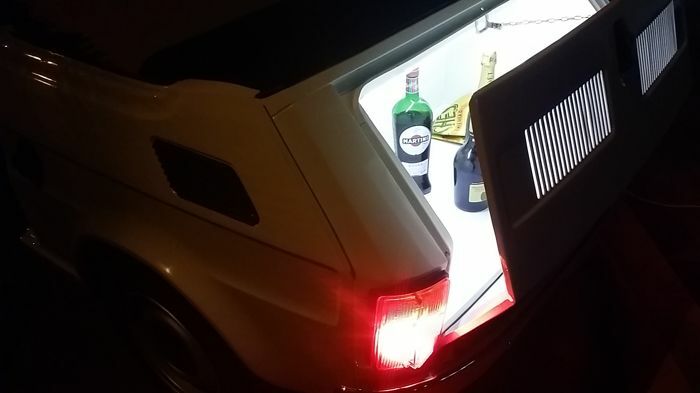 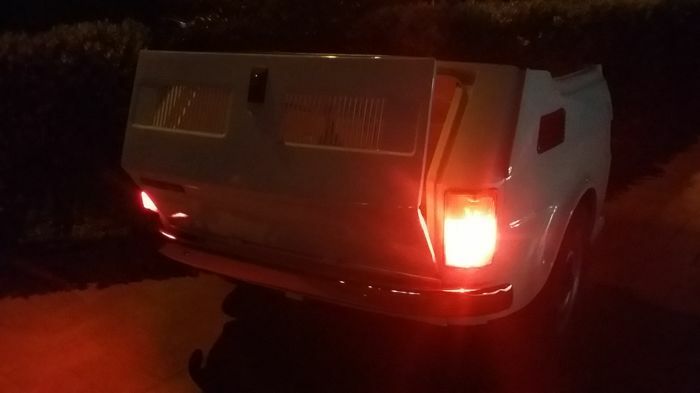 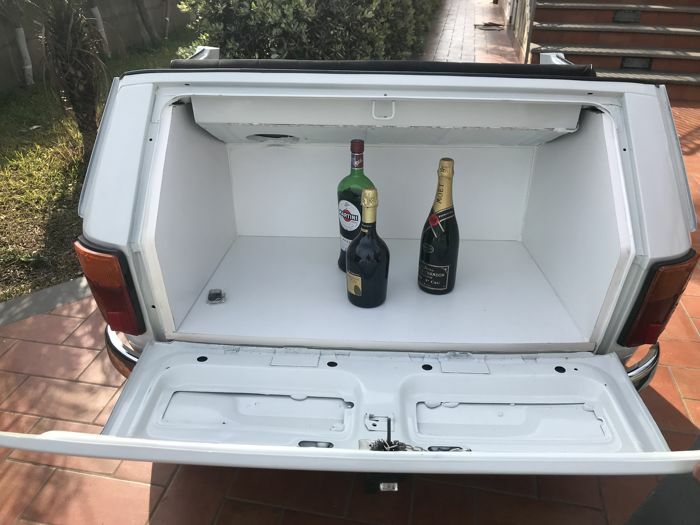 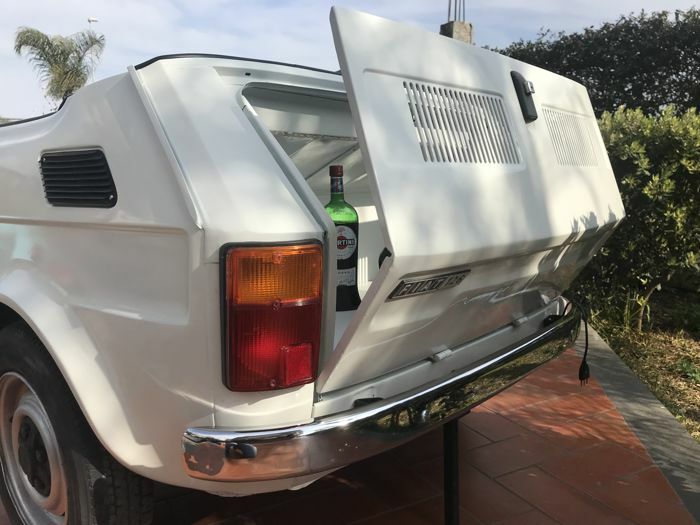 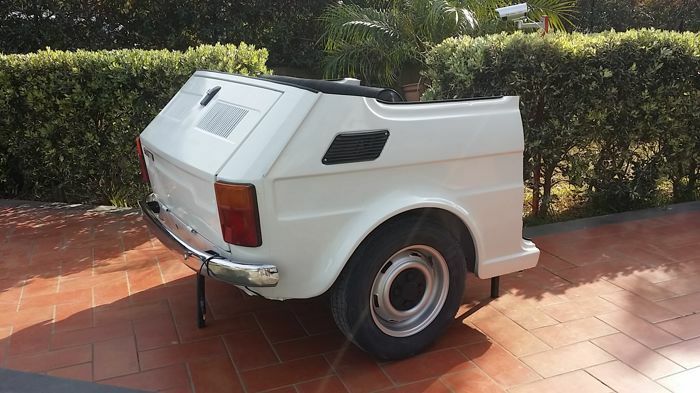 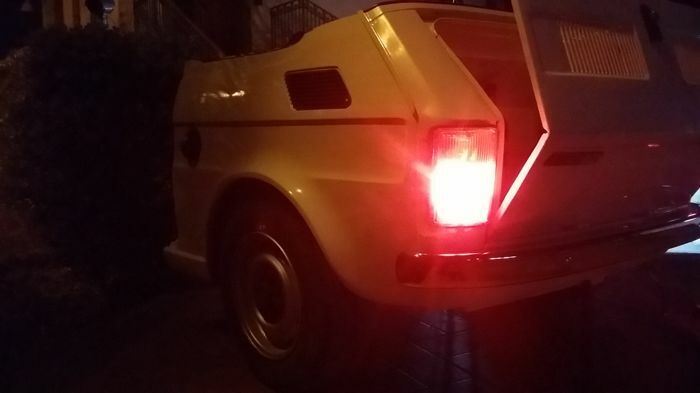 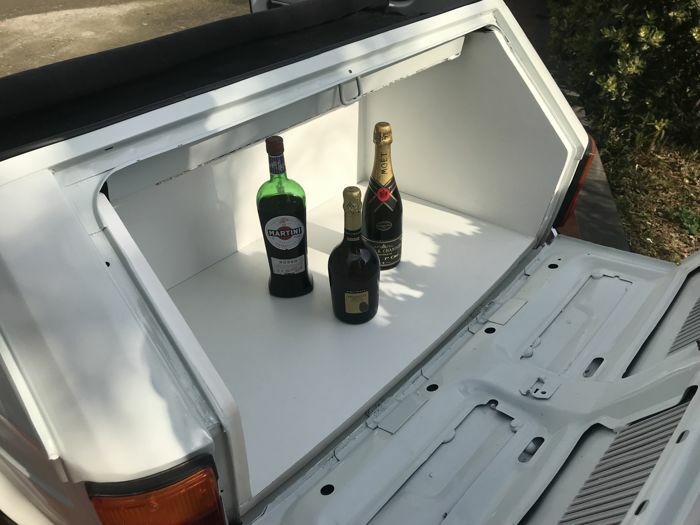 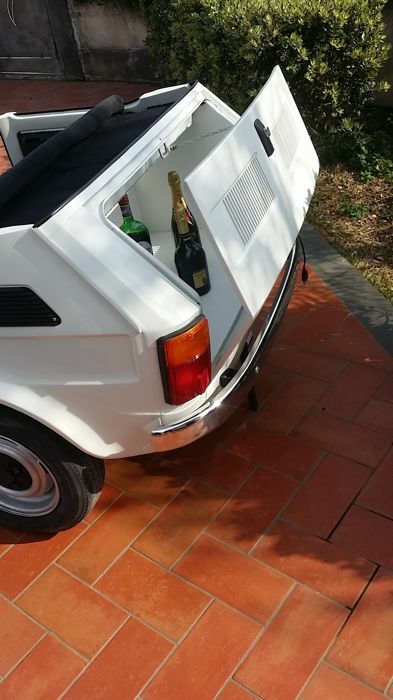 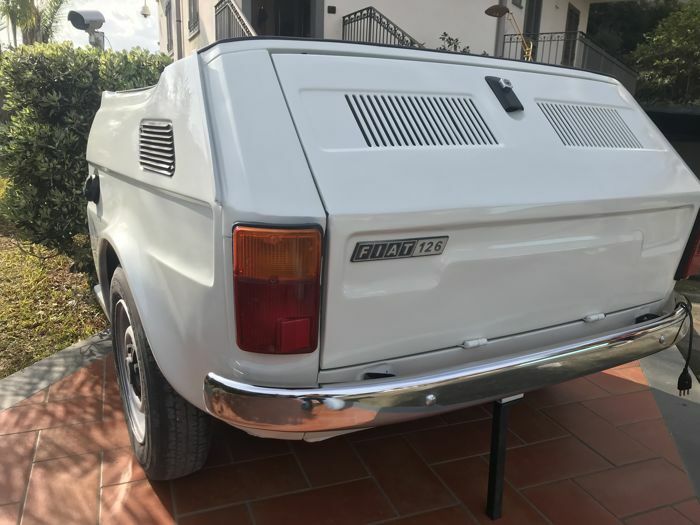 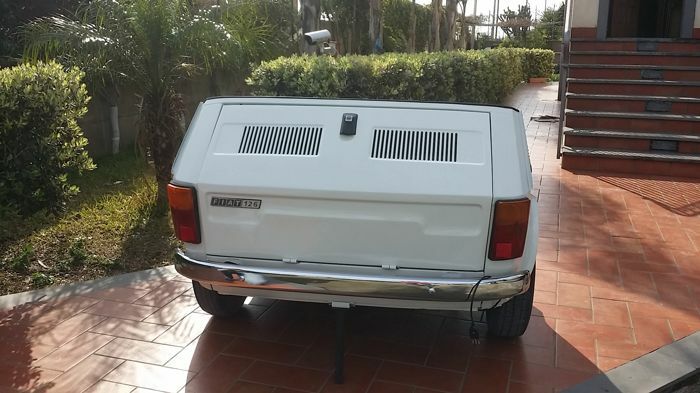 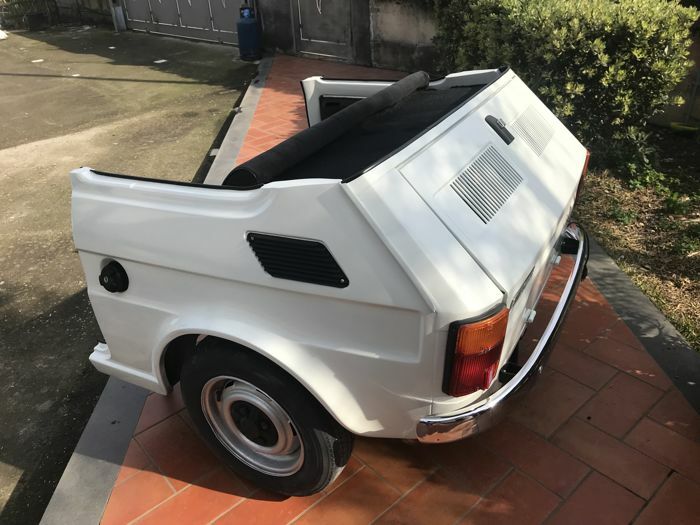 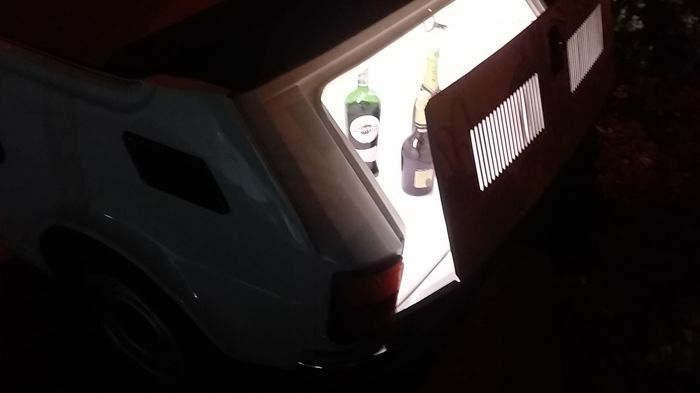 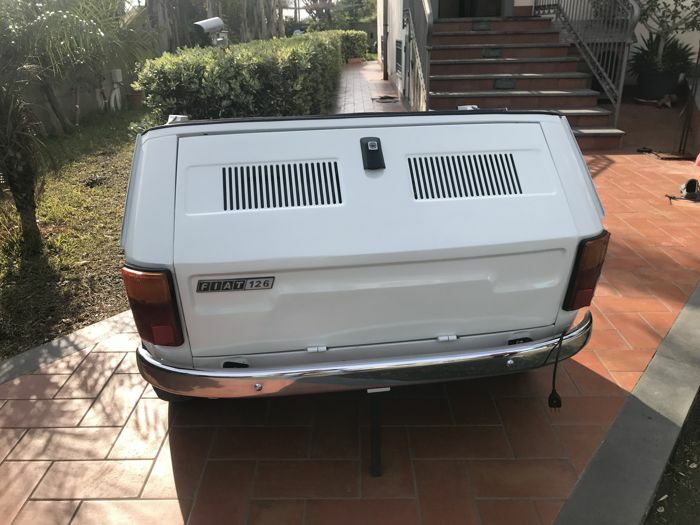 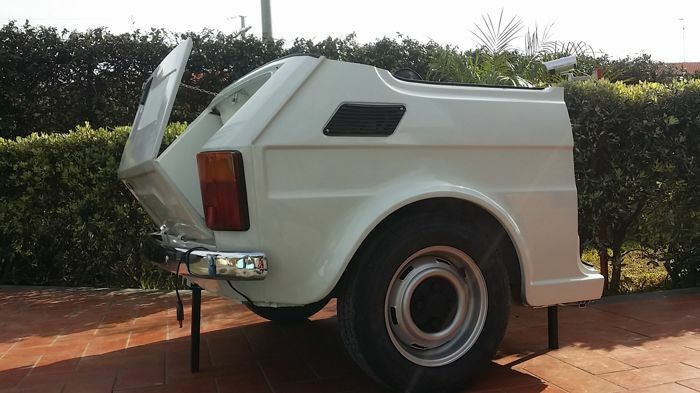 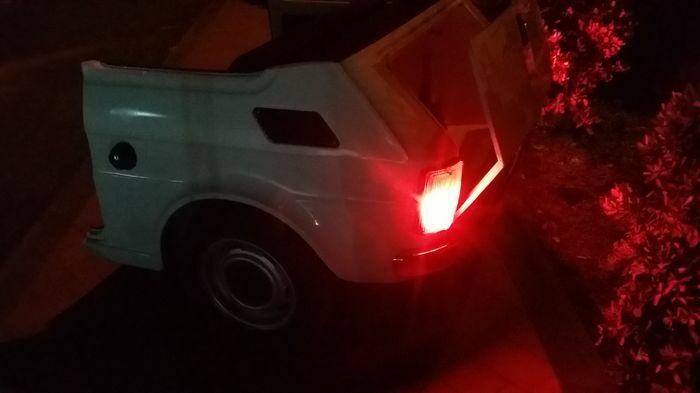 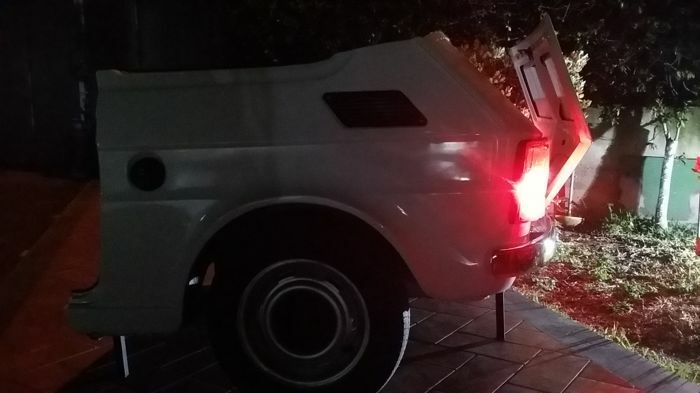 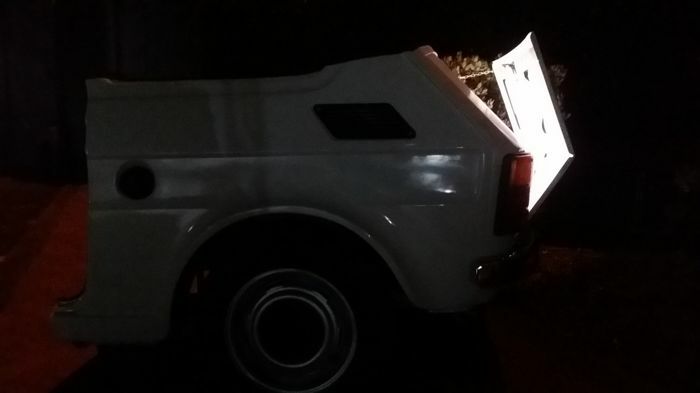 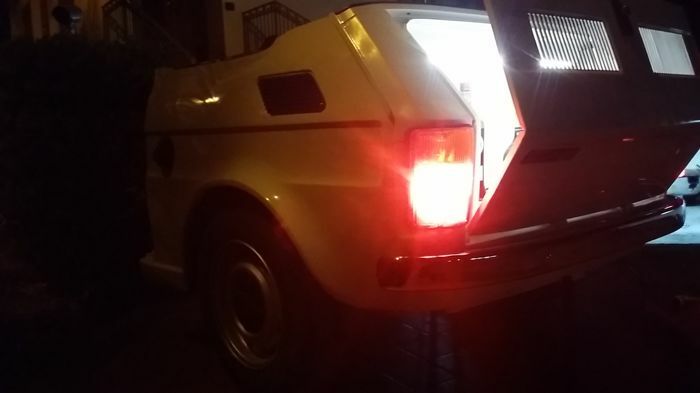 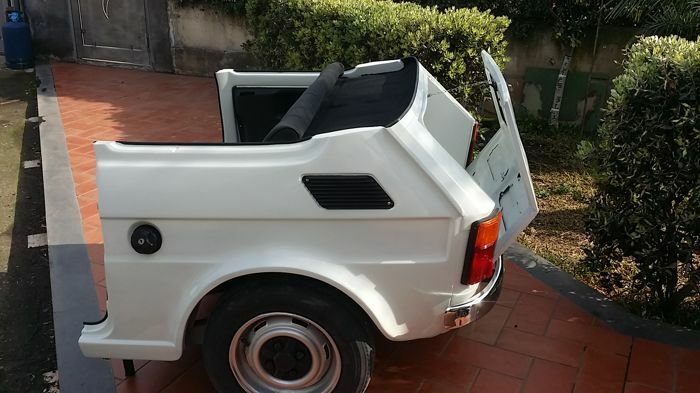 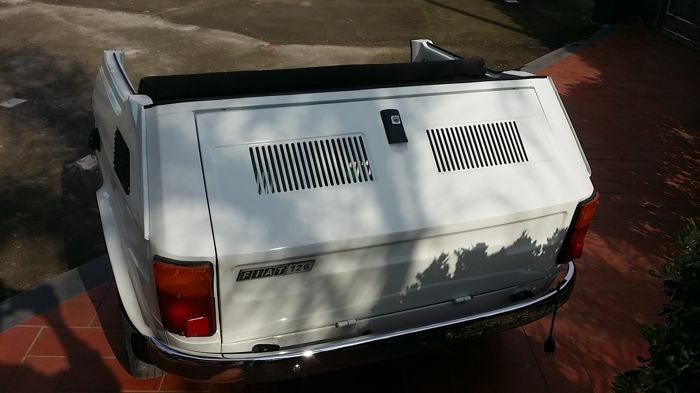 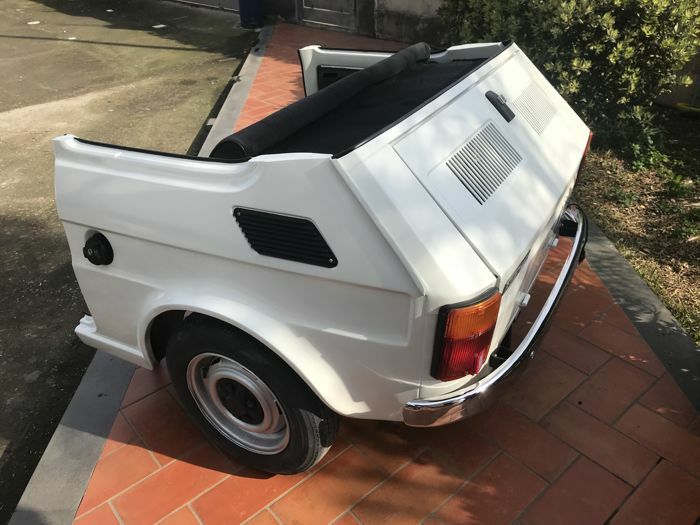 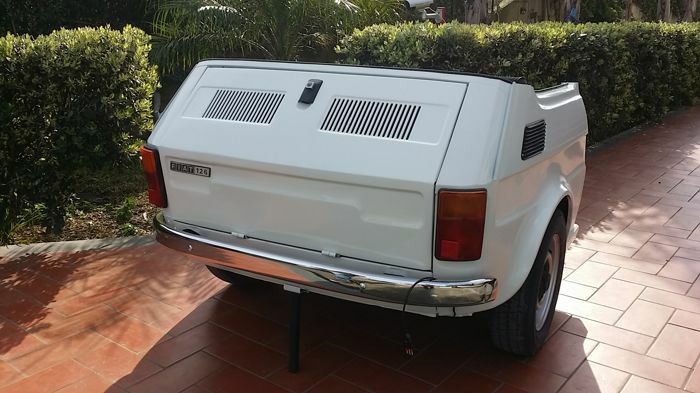 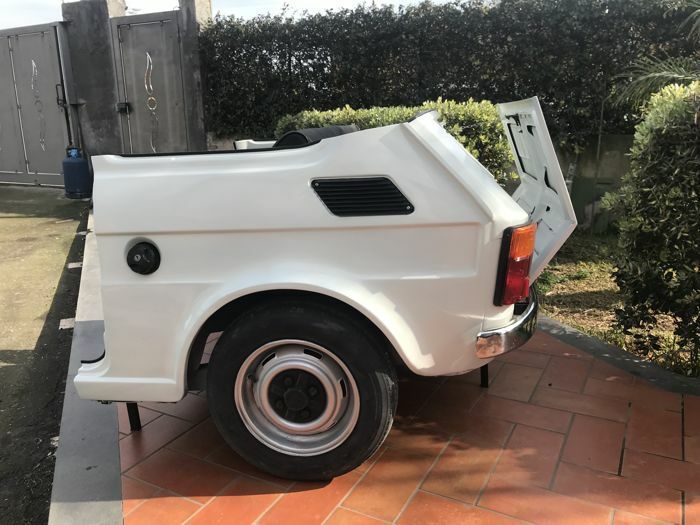 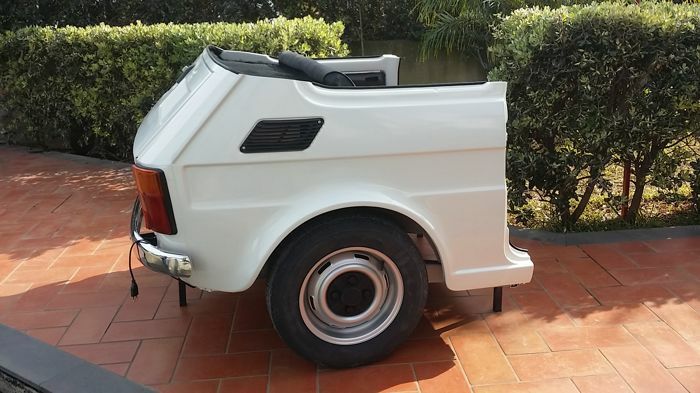 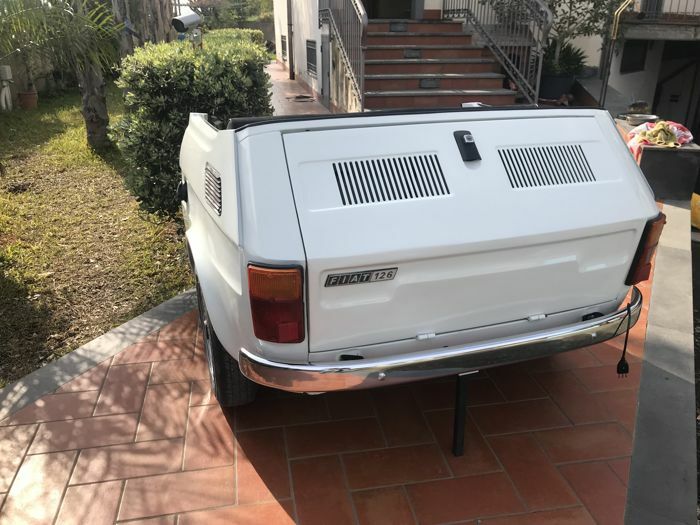 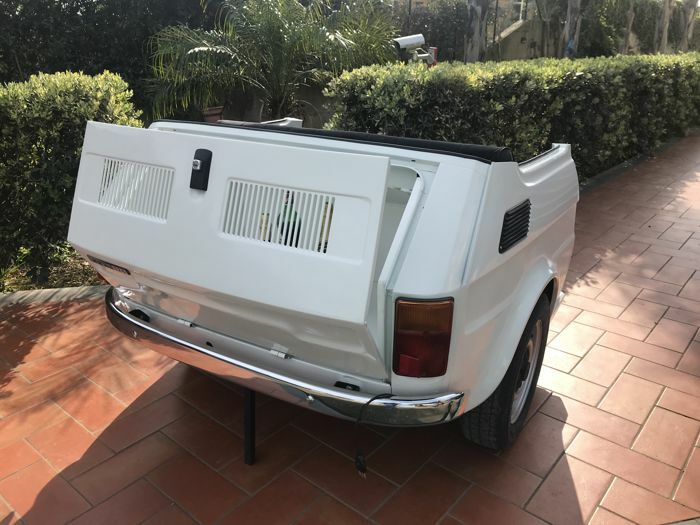 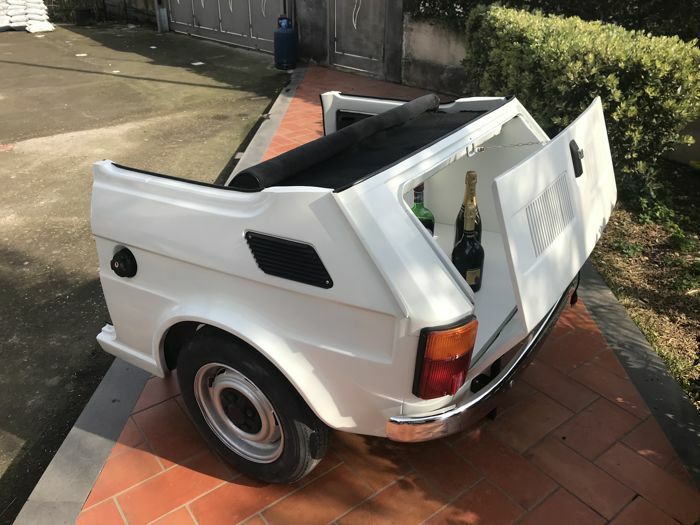 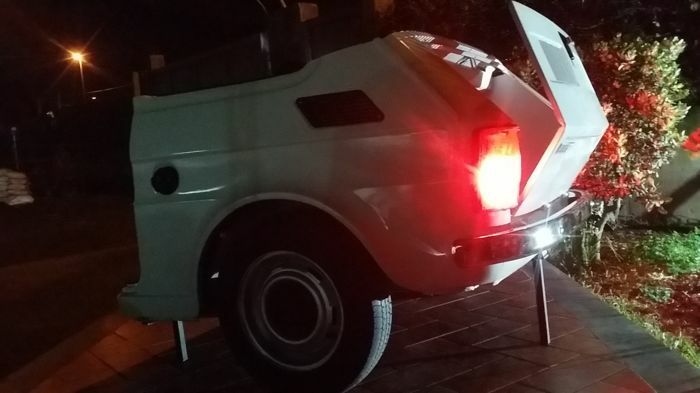 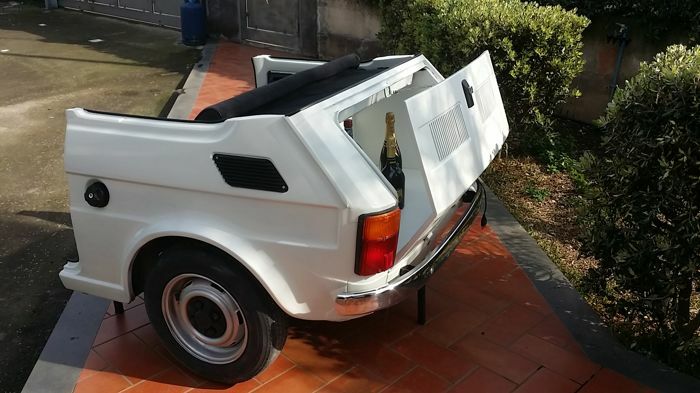 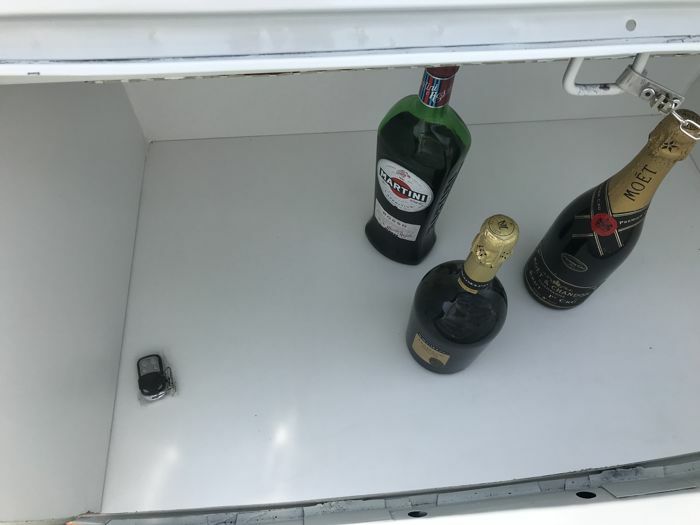 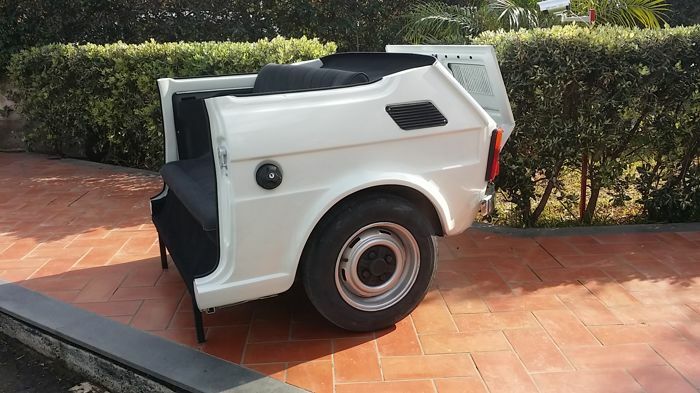 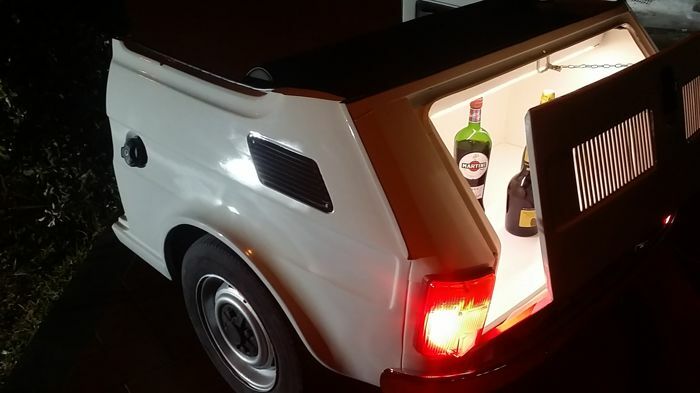 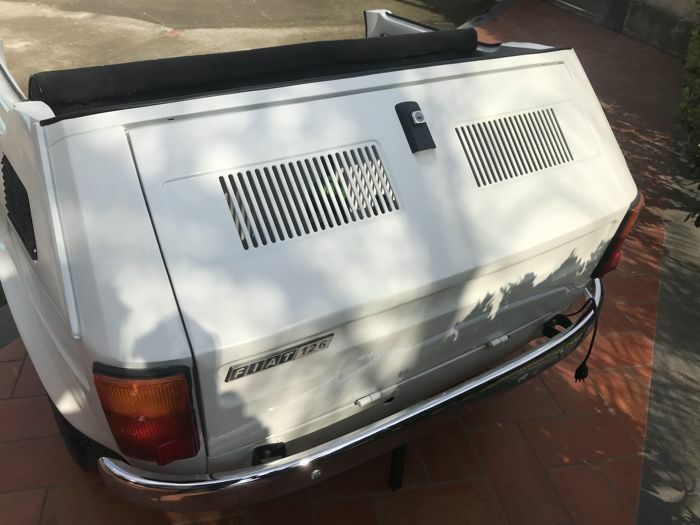 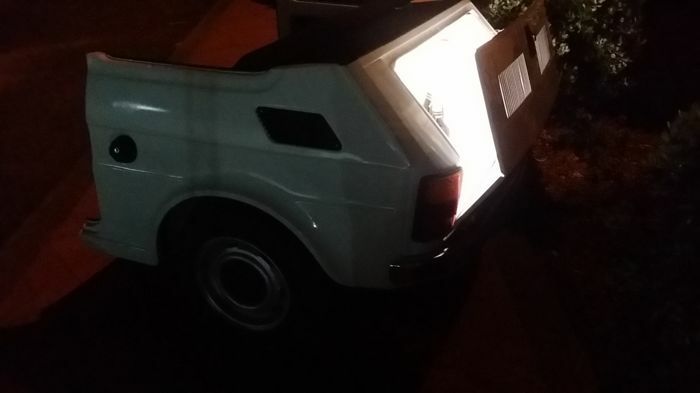 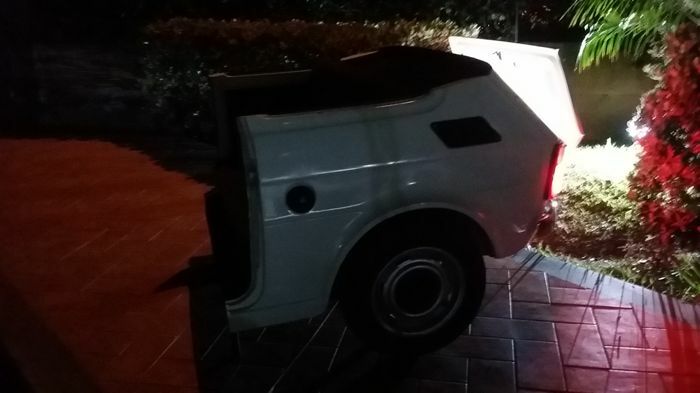 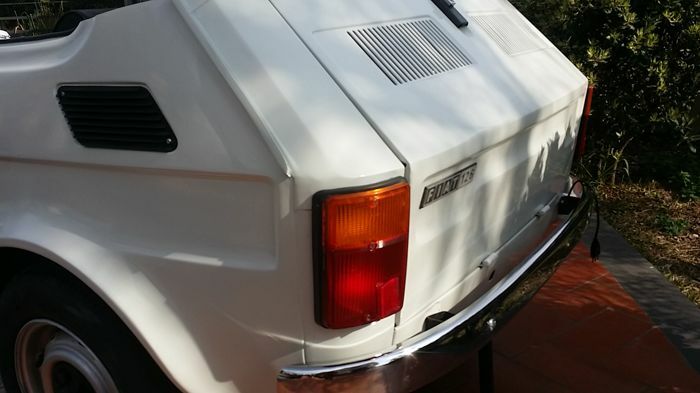 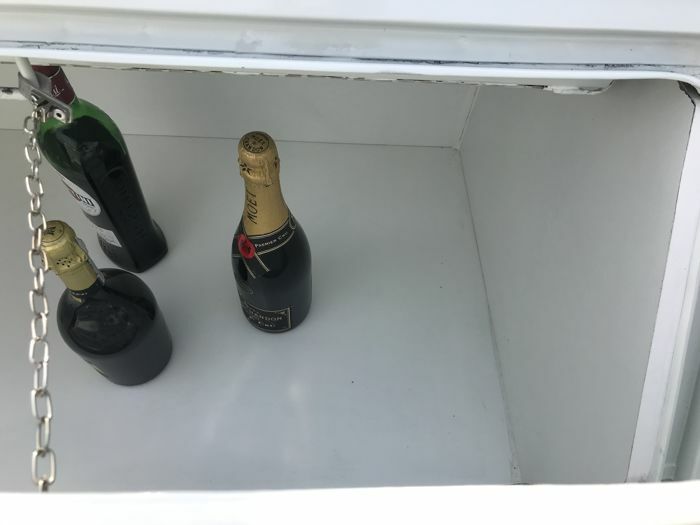 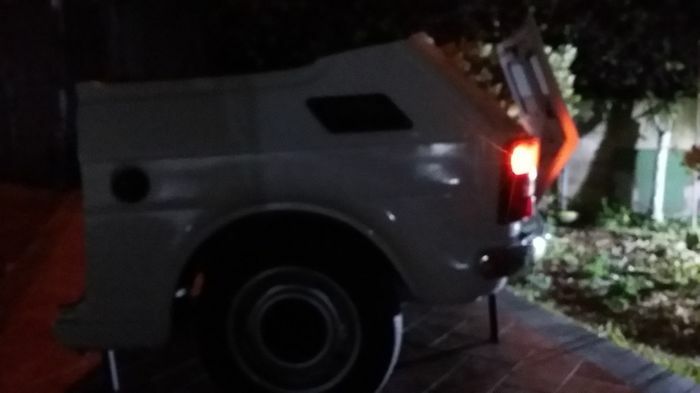 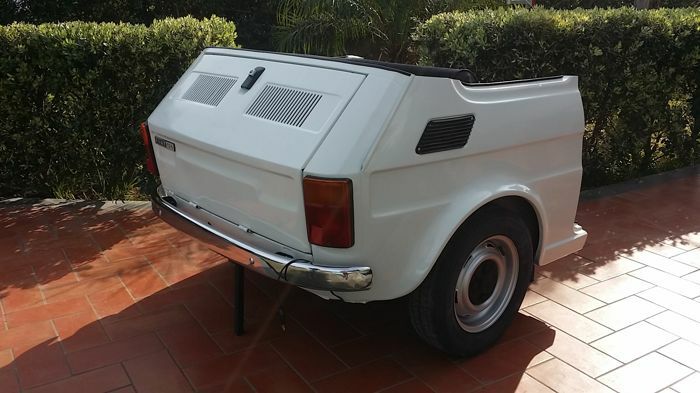 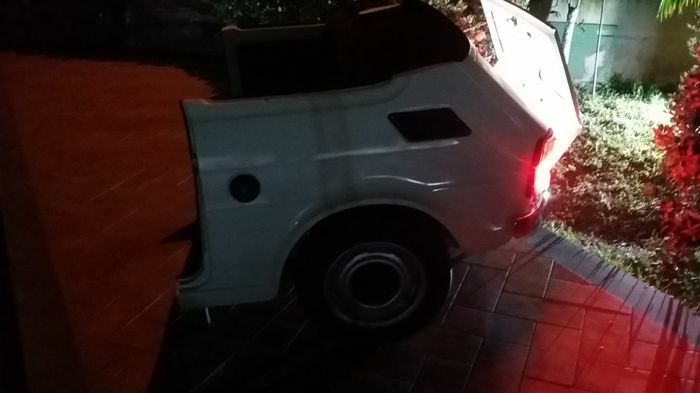 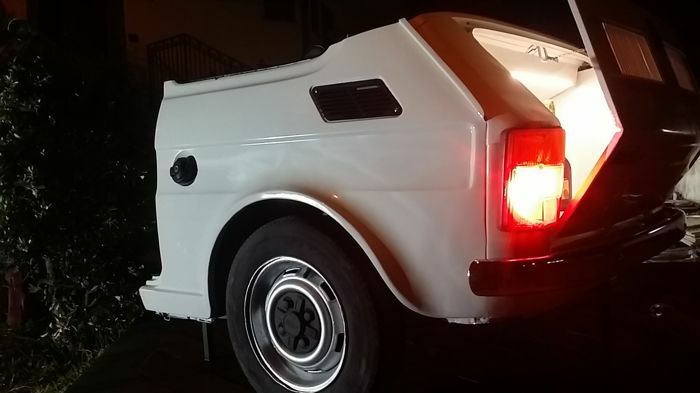 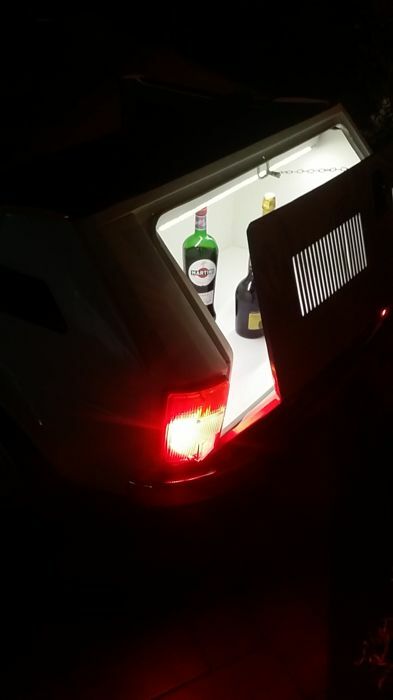 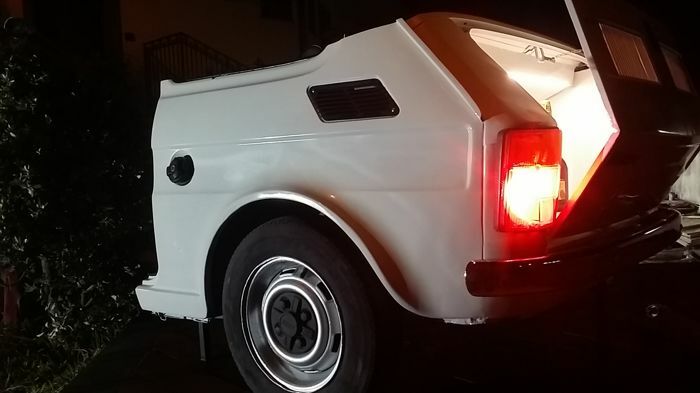 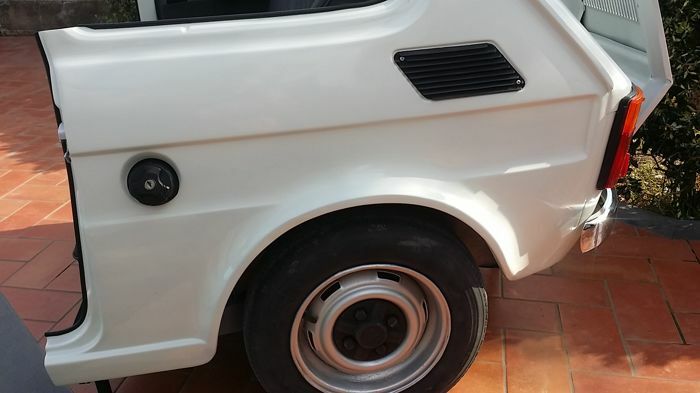 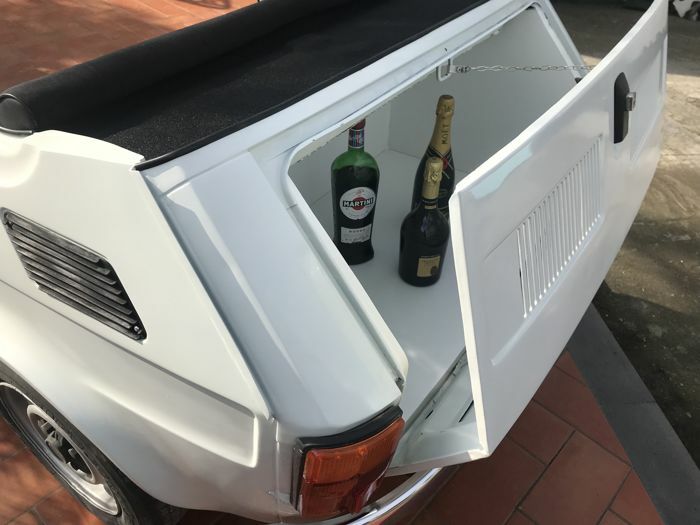 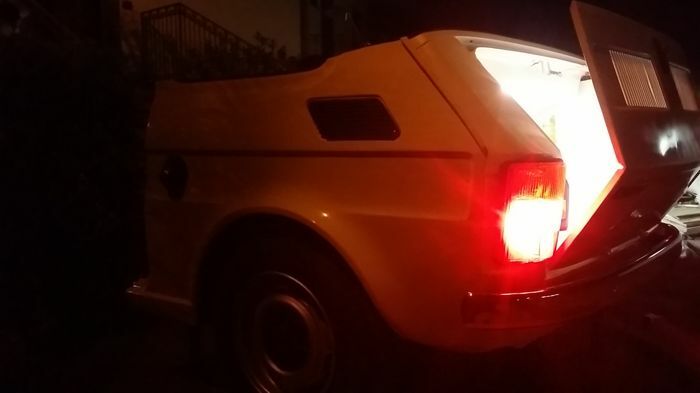 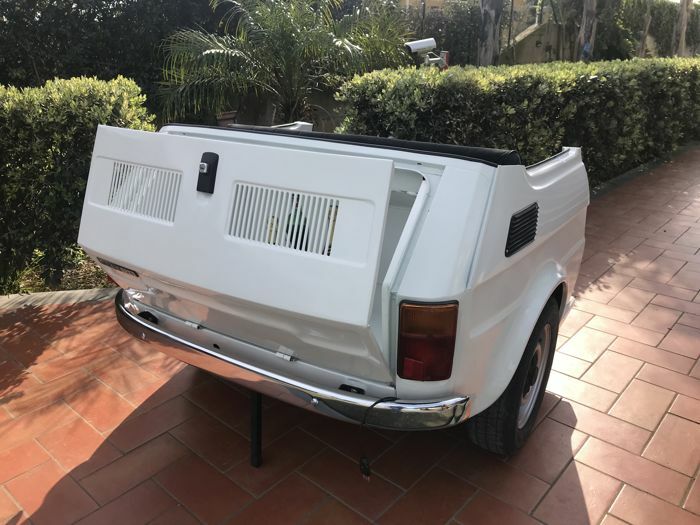 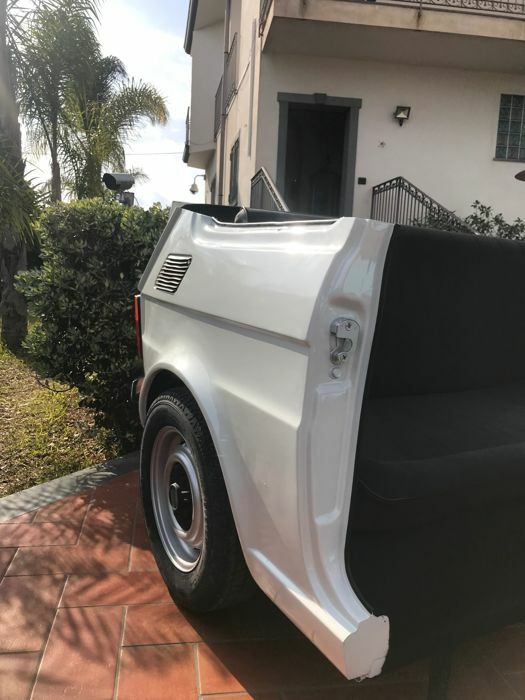 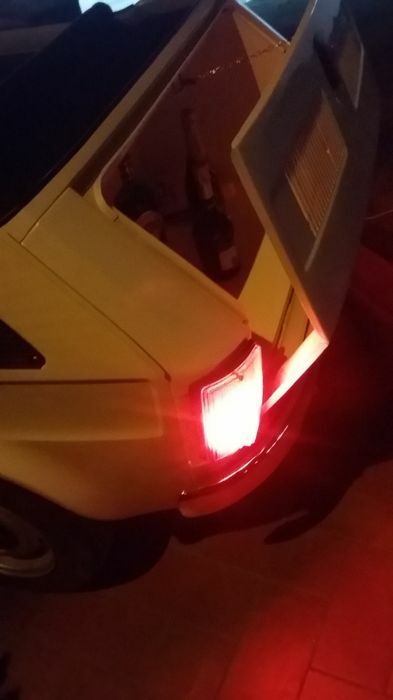 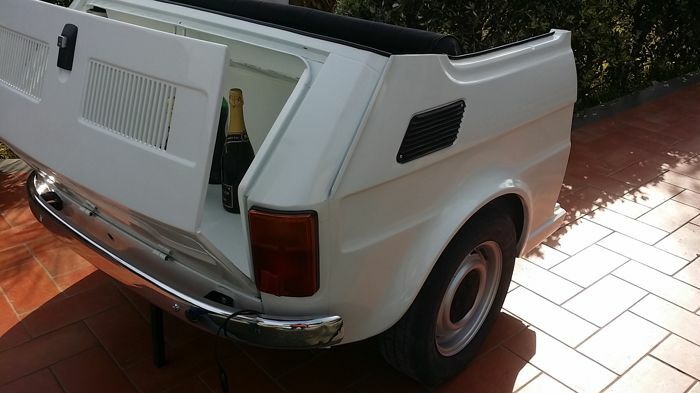 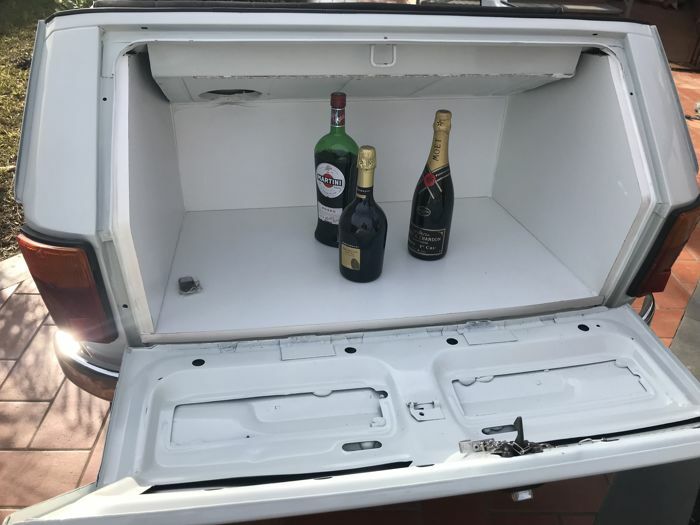 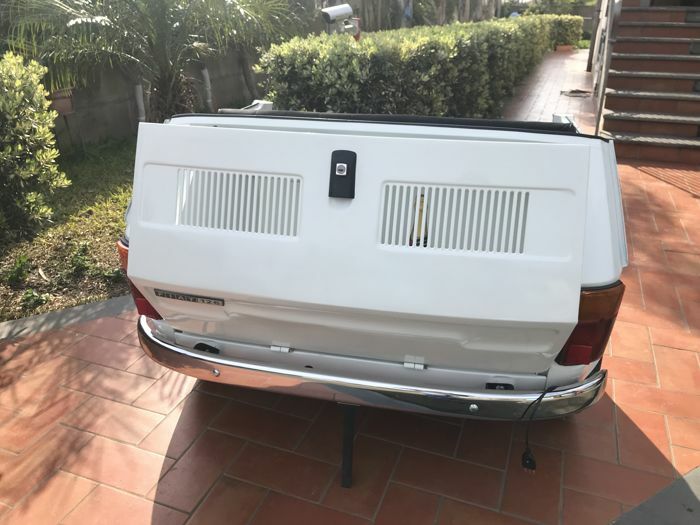 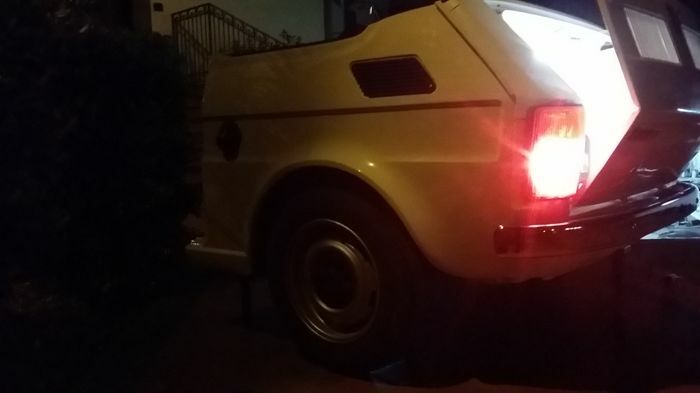 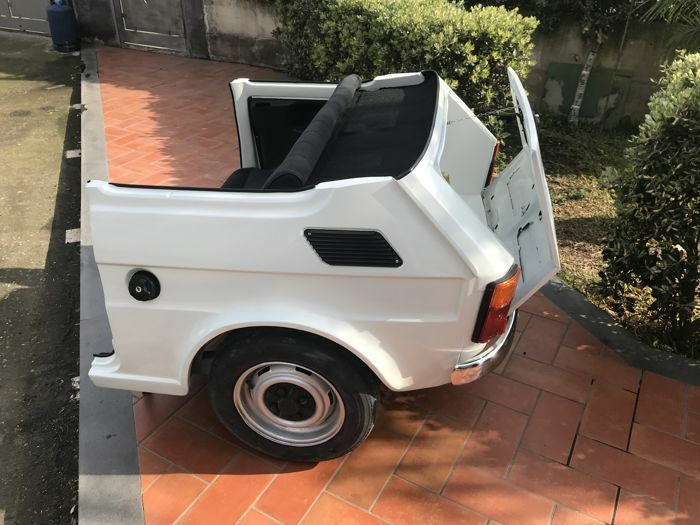 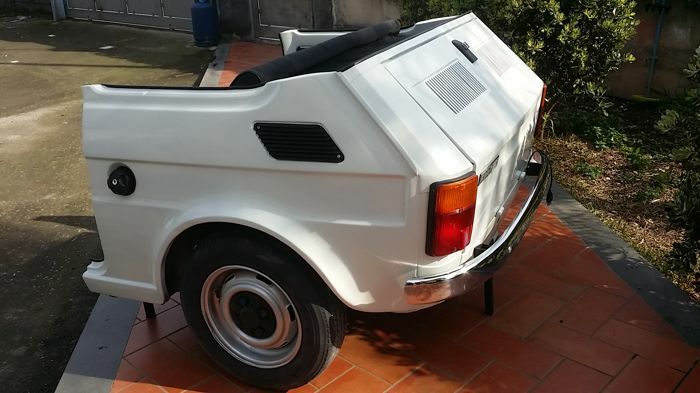 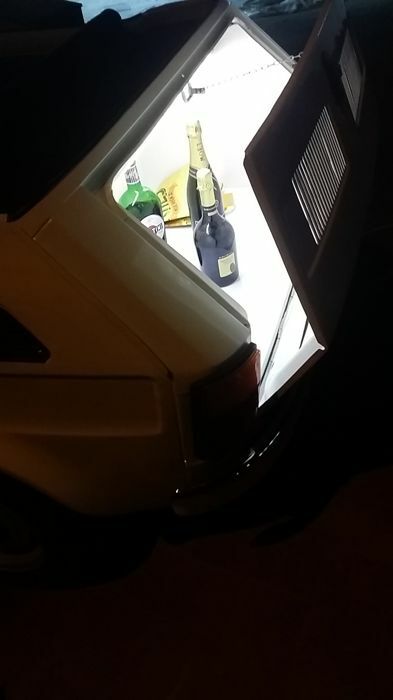 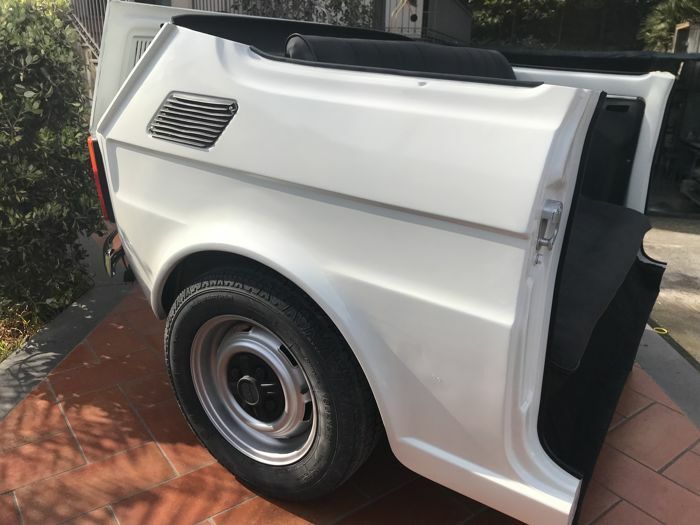 The Fiat 126 has a back storage cabinet in the compartment that you can use like a bottle storage. 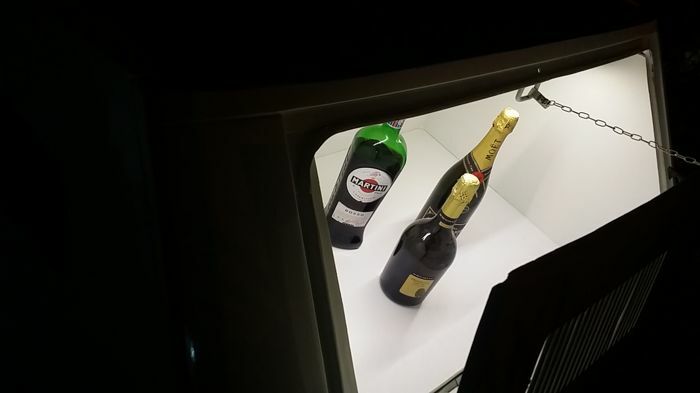 Cabinet with light. 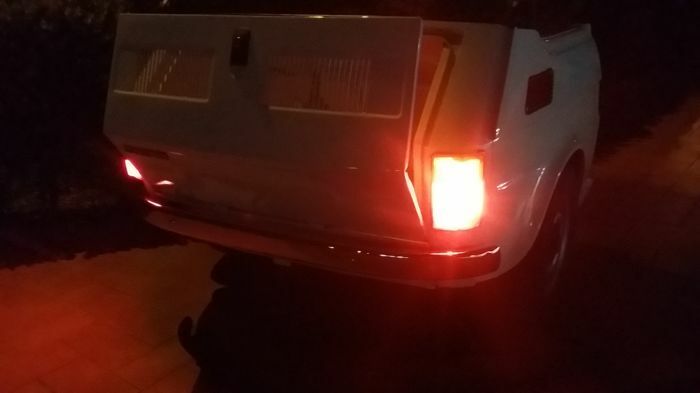 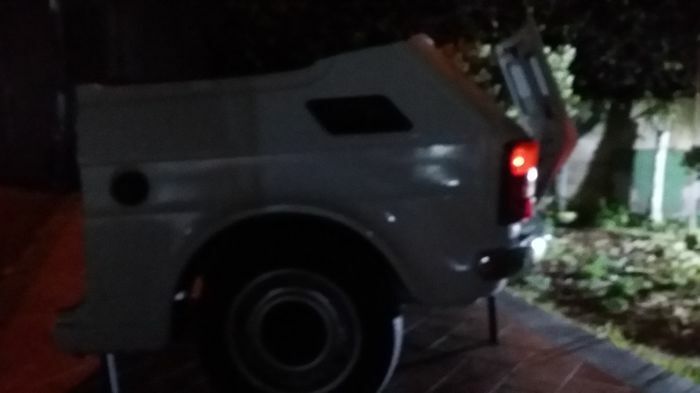 The posterior lights are fully working like in photos and are controlled by a remote controller that is included in the auction. 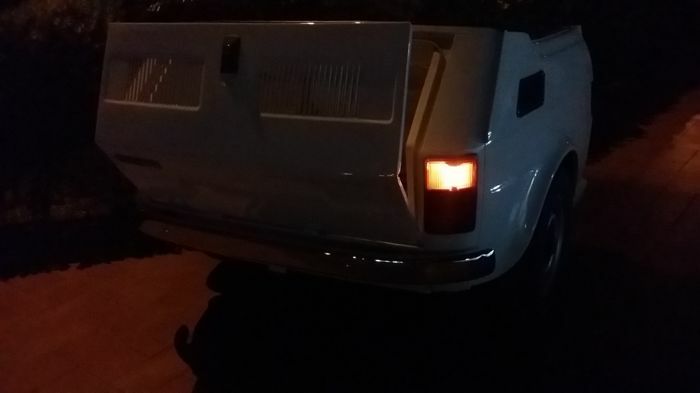 You can control the position lights, the turn signal (that flash in hazard warning mode). 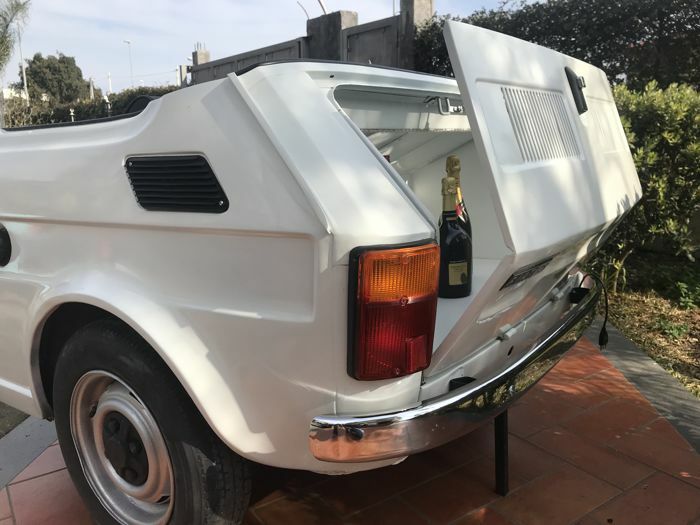 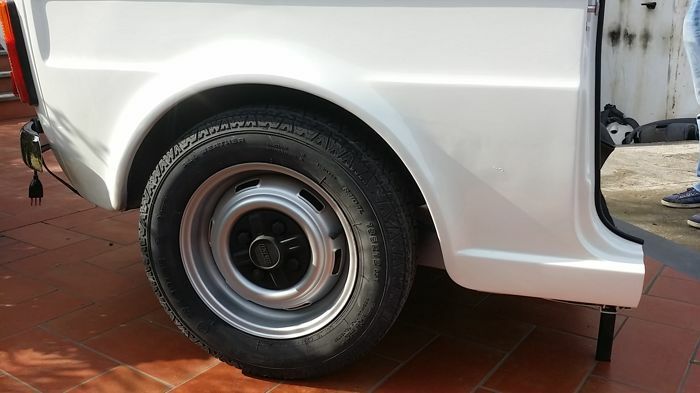 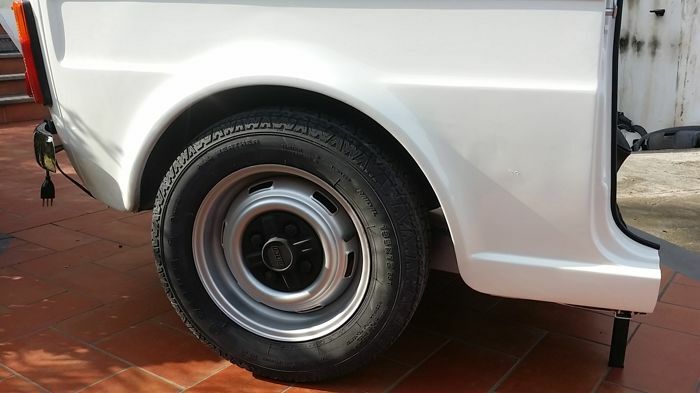 Provenance: This item come from a ex luxury dealer of Ferrari, Lamborghini, Maserati, Porsche, Mercedes, Lancia, Alfa Romeo, and other luxury brands. 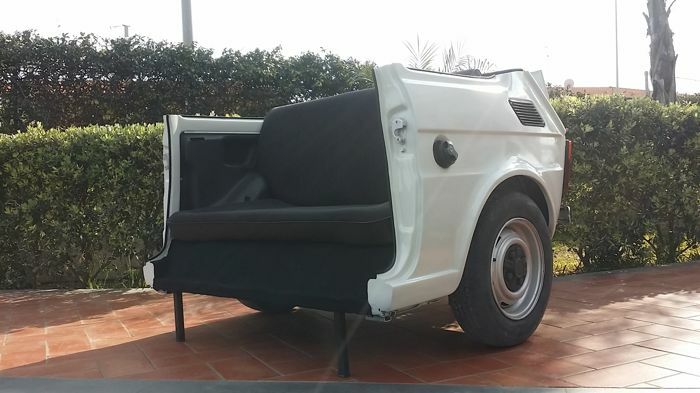 It was exhibit in the principal showroom. It's a real original item! 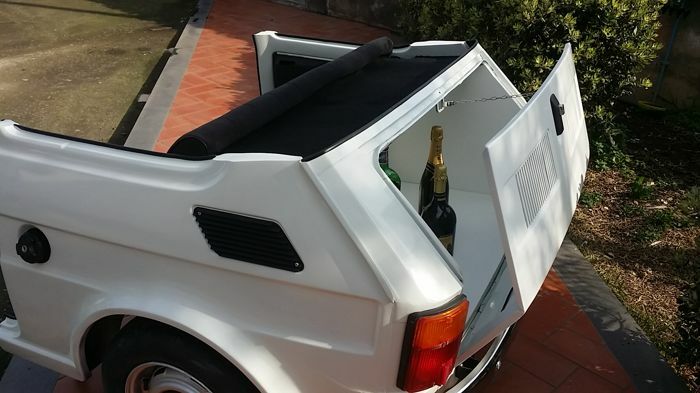 It is a really great item for your home , showroom, bar , garage , dealer ecc! 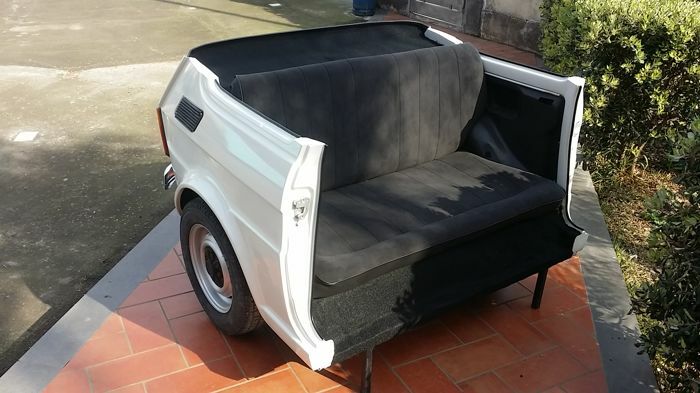 It is a unique piece that exist only in this exemplaire. 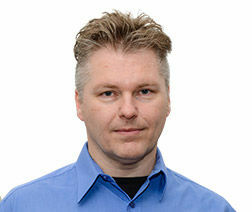 It can be or pick up or ship in safety and insured with express courier on a pallet in all Europe. 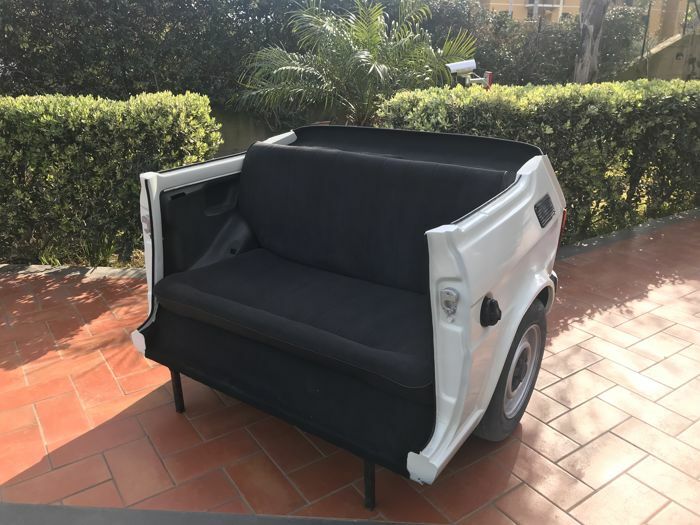 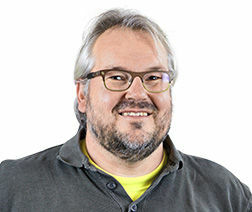 Price for Extra Eu delivery can to be arranged after the selling but not included in price. 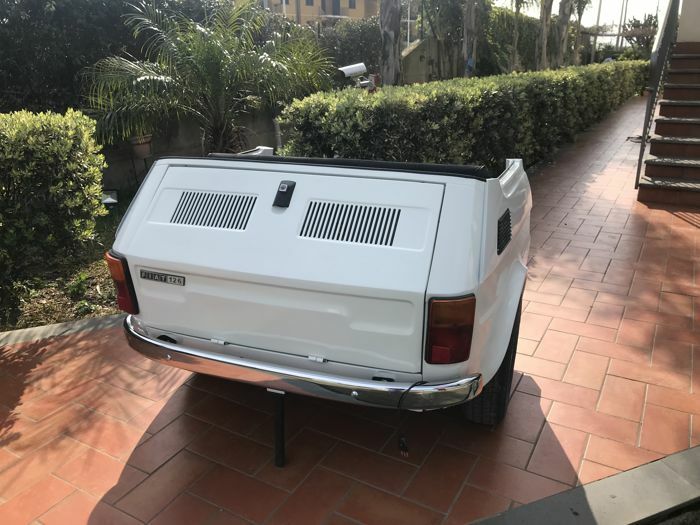 For extra eu is requested better the pick up in Italy. 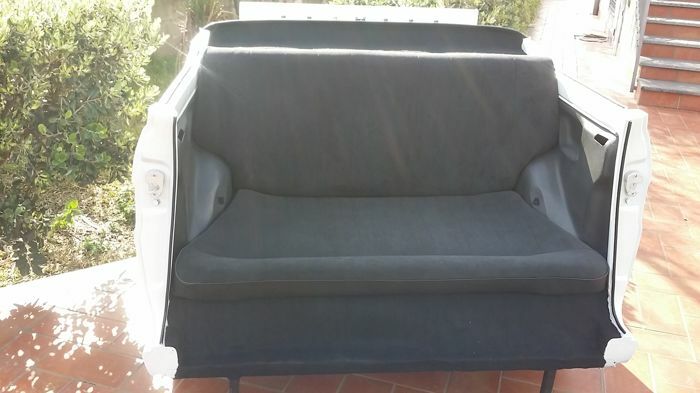 You can pick up this lot from the seller: Catania (Sicilia), Italy.